적어도 100 ㎎의 걸리 강성을 갖는 응집성이고 취급 가능한 웨브를 형성하도록 결합되고, 배향 및 섬유 구조를 유지하면서 추가로 연화될 수도 있는, 동일한 중합체 조성의 연속적인 1성분의 멜트스펀된 부분적으로 결정질이고 부분적으로 비정질인 배향된 섬유들의 1성분 단층 부직 웨브로부터 주름 필터가 제작된다. Coherent having rigidity take at least 100 ㎎ and handled and combined to form a possible web, the orientation and the melt spun partially of a continuous one-component of the same polymer composition, which may be softened by added while keeping the fiber structure crystalline and partially the pleated filter is made from a one-component single layer nonwoven web of amorphous oriented fibers. 소정 열의 주름이 부직 웨브 내에 형성되고, 이 웨브는 적어도 일부의 섬유 교차점에서 서로 결합되며 1.52 m/s의 면 속도에서 적어도 15%의 평균 초기 서브마이크로미터 효율을 갖는 섬유들의 자립식 다공성 1성분 단층 매트릭스를 포함하는 주름 필터 요소를 제공하기 위해 원하는 크기 및 형상으로 절단된다. A predetermined column wrinkles are formed in the nonwoven web, the web has at least a fiber-standing porous one-component single layer by being coupled to each other in some fiber crossing of having at least 15% of the average initial sub-micrometer efficiency in the face velocity of 1.52 m / s in order to provide a pleated filter element comprising a matrix is ​​cut into the desired size and shape. 필터 요소는 필터 매체 층 내에 강화 층, 2성분 섬유, 접착제 또는 다른 보강부를 필요로 하지 않고도 내변형성이다. The filter element is a deformation resistance without a strengthening layer, the bicomponent fibers, adhesive or other reinforcing parts required in the filter medium layer. 본 발명은 주름 필터에 관한 것이다. The present invention relates to a pleated filter. 멜트블로운 부직 섬유 웨브는 여과(예컨대, 편평 웨브 및 주름 필터), 절연재(insulation), 패딩(padding) 및 직물 대체품을 비롯한 다양한 목적으로 사용된다. Meltblown nonwoven fibrous webs are used for a variety of purposes including filtration (e. G., Flat web and pleated filters), insulation material (insulation), padding (padding) and fabric replacement. 부직 웨브 또는 그 제조에 관련된 특허 또는 출원은 미국 특허 제3,981,650호(페이지(Page)), 제4,100,324호(앤더슨(Anderson)), 제4,118,531호(하우저(Hauser)), 제4,818,464호(라우(Lau)), 제4,931,355호(라드반스키(Radwanski) 등), 제4,988,560호(메이어(Meyer) 등), 제5,227,107호(디킨슨(Dickenson) 등), 제5,273,565호(밀리건(Milligan) 등), 제5,382,400호(파이크(Pike) 등, '400), 제5,679,042호(바로나(Varona)), 제5,679,379호(파브리칸테(Fabbricante) 등), 제5,695,376호(다타(Datta) 등), 제5,707,468호(아놀드(Arnold) 등), 제5,721,180호(파이크 등, '180), 제5,877,098호(다나까(Tanaka) 등), 제5,902,540호(궉(Kwok)), 제5,904,298호(궉 등), 제5,993,543호(보다기(Bodaghi) 등), 제6,176,955 B1호(헤인즈(Haynes) 등), 제6,183,670 B1호(토로빈(Torobin) 등), 제6,230,901 B1호(오가따(Ogata) 등), 제6,319,865 B1호(미까미(Mikami)), 제6,607,624 B2호(베리 건(Berrigan) 등, '624), 제6,6 Nonwoven web or patents or applications relating to the manufacture are described in U.S. Patent No. 3.98165 million call (page (Page)), the 4,100,324 No. (Anderson (Anderson)), the 4,118,531 No. (Hauser (Hauser)), the 4,818,464 No. (Lau (Lau )), a 4,931,355 number (RAD half ski (Radwanski), etc. ), a 4.98856 million call (Meyer (Meyer), etc. ), a 5,227,107 number (Dickinson (Dickenson), and the like), and the like 5,273,565 No. (Milligan (Milligan)), the (such as pike (Pike), '400) 5,382,400, 1 - (such as data (Datta)) 5,679,042 No. (directly or (Varona)), a 5,679,379 number (Fabry Alicante (Fabbricante), etc. ), the 5,695,376, 1 - 5,707,468 No. (Arnold (Arnold), and so on), the 5.72118 million call (Pike et al., '180), agent (such as Tanaka (Tanaka)) 5,877,098, 1 - 5.90254 million call (gwok (Kwok)), a 5,904,298 number (gwok, etc. ), the 5,993,543 call (rather than (Bodaghi), etc. ), the 6,176,955 (such as Haynes (Haynes)) B1, 1 - 6,183,670 B1 No. (Sat Robin (Torobin), etc. ), the 6,230,901 B1 No. (O gatta (Ogata) and the like), the 6,319,865 No. B1 (not kkami (Mikami)), a No. 6,607,624 B2 (berry gun (Berrigan) or the like, '624), the 6,6 67,254 B1호(톰슨(Thompson) 등), 제6,858,297 B1호(샤(Shah) 등) 및 제6,916,752 B2호(베리건 등, '752); No. 67,254 B1 (Thomson (Thompson), and so on), the arc B1 6,858,297 (Shah (Shah), and so on) and a No. 6,916,752 B2 (such as berry case, '752); 유럽 특허 제0 322 136 B1호(미네소타 마이닝 앤드 매뉴팩처링 컴퍼니(Minnesota Mining and Manufacturing Co.)); European Patent No. 0 322 136 B1 (Minnesota Mining and-Manufacturing Company (Minnesota Mining and Manufacturing Co.)); 일본 특허 출원 공개 제2001-049560호(닛산 모터 컴퍼니 리미티드(Nissan Motor Co. Ltd.)), 제2002-180331호(치소 코포레이션(Chisso Corp.), '331) 및 제2002-348737호(치소 코포레이션, '737); Japanese Patent Application Publication No. 2001-049560 No. (Nissan Motor Company Limited (Nissan Motor Co. Ltd.)), the No. 2002-180331 (Chisso Corporation (Chisso Corp.), '331) and a number 2002-348737 (Chisso Corporation , '737); 및 미국 특허 출원 공개 제2004/0097155 A1호(올슨(Olson) 등)를 포함한다. And U.S. Patent Application Publication No. 2004/0097155 A1 includes a (Olson (Olson), and so on). 주름 필터에 관련된 특허 또는 출원은 미국 특허 제4,547,950호(톰슨), 제5,240,479호(바친스키(Bachinski)), 제5,709,735호(미드키프(Midkiff) 등), 제5,820,645호(머피, 주니어(Murphy, Jr.)), 제6,165,244호(최(Choi)), 제6,521,011 B1호(썬뎃(Sundet) 등, '011), 제6,740,137 B2호(구보까와(Kubokawa) 등) 및 제D449,100 S호(썬뎃 등, '100), 및 미국 특허 출원 공개 제2003/0089090 A1호(썬뎃 등, '090), 제2003/0089091 A1호(썬뎃 등, '091) 및 제2005/0217226 A1호(썬뎃 등, '226)를 포함한다. Patents or applications relating to the pleated filter is U.S. Patent No. 4.54795 million call (Thompson), a 5,240,479 number (dedicated ski (Bachinski)), a 5,709,735 number (mid Keefe (Midkiff), etc. ), a 5,820,645 number (Murphy, Jr. (Murphy, Jr.)), the No. 6,165,244 (Choi (Choi)), the arc B1 6,521,011, etc. (sseondet (Sundet), '011), 6,740,137 B2 the arc (Kubo and how (Kubokawa), etc.) and the S No. D449,100 (sseondet like, '100) and U.S. Patent Application Publication No. 2003/0089090 A1 (such as sseondet,' 090), a 2003/0089091 (such sseondet, '091) A1) and (No. 2005/0217226 A1 (sseondet etc. , and a "226). 주름 필터를 제조하기 위한 기존의 방법은 대체로 웨브 또는 필터 특성의 약간의 절충을 수반한다. Conventional method for manufacturing a pleated filter will generally involve some compromise of web or filter characteristics. 예를 들어, 일렉트릿 대전 섬유를 포함하는 고효율 필터가 요망될 때, 한 가지 대책은 1차 여과 매체로서 정전기 대전된 멜트블로운 웨브를 이용하는 다층 필터를 형성하는 것이다. For example, when the high efficiency filter comprising the electret charged fibers is desired, one countermeasure is to form a multi-layered filter using the electrostatic charging of meltblown web as a primary filter media. 멜트블로운 섬유는 전형적으로 분자 수준에서 약하게 배향되거나 또는 배향되지 않고, 이 섬유는 전형적으로 높은 효율 및 충분한 강도를 갖는 단일 층 필터 매체를 자체적으로 제공하기에는 불충분한 강성 및 강도이다. Meltblown fibers are typically not oriented, or weakly oriented on the molecular level, the fibers are typically in the high efficiency and insufficient rigidity and strength hagieneun itself provides a single-layer filter medium which has a sufficient strength. 불충분한 강도는 예를 들어 변환 중의 손상에 의해, 또는 높은 유체 유동 조건에서의 사용 중의 주름 변형 또는 주름 붕괴에 의해 명백해질 수 있다. Insufficient strength, for example, may be evident by the deformation or wrinkles wrinkles collapse of use in, or high fluid flow condition by the damage of the conversion. 하나 이상의 추가 층이 필터 매체에 추가되어 필터 매체를 보호하고 전체 필터 구성을 강화할 수 있다. At least one further layer is added to the filter medium can protect the filter medium and enhances the overall filter configuration. 그러한 다층 필터 내에 이용될 수 있는 추가 층은 스테이플 섬유 웨브, 멜트스펀 웨브, 스크림(예컨대, 유리 섬유 또는 쵸핑된 섬유 매트) 및 와이어 메시를 포함한다. Additional layers that may be used within such a multi-layer filter includes a staple fiber webs, melt spun webs, scrim (e.g., glass fibers or a chopped fiber mat) and the wire mesh. 다층 필터를 제조하는 것은 필터 제품에 추가적인 비용 및 복잡성을 도입한다. It is for producing a multi-layer filter introduces additional cost and complexity to the filter product. 지지 층은 효율에는 기여하지 않으면서 압력 강하를 증가시킬 수 있다. The support layer, the efficiency can be increased up to the pressure drop do not contribute. 다중 층의 사용은 폐 필터 또는 중고 필터를 재생하는 것을 어렵게 하거나 또는 비실용적이게 할 수 있다. The use of multiple layers can make it difficult or impractical to reproduce this waste filter or filters used. 단층 주름 필터 제품이 몇몇 용도에 사용되어 왔다. Single-layer pleated filter products have been used for several purposes. 예를 들어, 주거용 화로 필터(furnace filter)가 킴벌리 클라크(Kimberly Clark)의 어큐에어(ACCUAIR)™ 2성분 스펀본드 매체의 단일 층으로부터 제작되었다. For example, a residential furnace filter (furnace filter) was produced from a single layer of air eokyu (ACCUAIR) ™ 2 components of the Kimberly-Clark (Kimberly Clark) spunbond media. 어큐에어 매체는 상업용 또는 산업용 용도에서 발생할 수 있는 전형적인 유량 또는 압력을 받도록 되어 있는 단층의 주름진 HVAC 필터로서 사용되기에는 불충분한 강성이다. Eokyu air medium is has sufficient rigidity doegie used as a single layer of corrugated HVAC filter which is to receive the typical flow rate or pressure that may occur in commercial or industrial applications. 전술한 썬뎃 등의 '226 출원은 대부분이 주름의 열 방향에 대해 90°± 20°로 정렬된, 멜트블로운 섬유(예컨대, 폴리프로필렌, 폴리에스테르 또는 나일론 섬유)의 단일 층으로부터 제조된 주름진 화로 필터를 설명하고 있다. Of the aforementioned sseondet and '226 application is most hearth of the corrugated made from a single layer of aligned to 90 ° ± 20 ° to the column direction of the folds, meltblown fibers (e.g., polypropylene, polyester or nylon fibers) and it describes the filter. 파이버글래스 여과 매체가 또한 단층 주름 필터로서 이용되었지만, 파이버글래스는 대전되지 않고, 높은 압력 강하를 가질 수 있고, 유리 섬유를 방출하고, 일부 형상으로 형성되기가 어려울 수 있다. Although the use of glass fiber filtering medium is also a single layer pleated filter, a glass fiber is not charged, may have a high pressure drop, it may be difficult to release the glass fibers, and formed into a part shape. 주름 성형성, 주름질 때의 강성, 낮은 압력 강하 및 효율적인 미립자 포획의 유용한 조합을 갖는 주름 필터로 형성될 수 있는 1성분 단층 웨브를 이제 발견하였다. The folds formability, one-component monolayer webs which can be formed by folds in when the rigid, pleated filter having a useful combination of low pressure drop and efficient particle capture now been found. c) 적어도 일부의 섬유 교차점에서 서로 결합된 섬유들의 자립식 다공성 1성분 단층 매트릭스를 포함하며, 1.52 m/s의 면 속도에서 적어도 15%의 평균 초기 서브마이크로미터 효율(submicron efficiency)을 갖는 주름 필터 요소를 형성하기 위해 원하는 크기 및 형상으로 주름진 웨브를 절단하는 단계를 포함한다. c) pleated filter having at least, and in some fiber crossing of including freestanding porous one-component single layer matrix of the binding fibers with each other, 1.52 m / s, at least 15% of the average initial sub-micron efficiency (submicron efficiency) in the surface speed of the and a step of cutting the pleated web to a desired size and shape to form the element. 다른 태양에서, 본 발명은 적어도 일부의 섬유 교차점에서 서로 결합된 동일한 중합체 조성의 부분적으로 결정질이고 부분적으로 비정질인 배향된 멜트스펀 중합체 섬유들의 자립식 다공성 1성분 단층 매트릭스를 포함하는 주름 필터를 제공하는데, 상기 매트릭스는 접히거나 물결 모양의 소정 열의 주름으로 형성되고 1.52 m/s의 면 속도에서 적어도 15%의 평균 초기 서브마이크로미터 효율을 갖는다. In another embodiment, the invention provides a pleated filter including at least some of the fibers crossing the part of the same polymeric composition bonded to each other crystalline and partially amorphous oriented melt spun polymeric fiber-standing porous one-component single layer matrix of the matrix is ​​folded or formed into folds having a predetermined column wavy has at least 15% of the initial average submicrometer efficiency at a face velocity of 1.52 m / s.
개시된 주름 필터는 다수의 유익하고 고유한 특성을 갖는다. The disclosed pleated filters have a number of beneficial and unique properties. 예를 들어, 완성된 주름 필터는 단일 층으로만 구성되도록 제조될 수 있지만, 부분적으로 결정질이고 부분적으로 비정질인 배향된 중합체 섬유의 혼합물을 포함하며, 개선된 성형성 및 주름 형성 이후의 감소된 여과 성능 손실을 갖는다. For example, the finished pleated filter can be made to consist only of a single layer, but, partially crystalline and partially comprises a mixture of amorphous oriented polymeric fibers, and an improved moldability and wrinkles reduced filtration after the formation It has a performance loss. 그러한 주름 필터는 중요한 효율을 제공하는데, 즉 라미네이팅 공정 및 장비를 제거하고 중간 재료의 수를 줄임으로써 제품의 복잡성 및 낭비가 감소된다. Such wrinkles filter to provide a significant efficiency, that is reduced to remove the laminating processes and equipment and products by reducing the number of intermediate complexity, and waste materials. 섬유 형성 중합체 재료가 하나의 본질적으로 직접적인 작업으로 웨브로 변환되는 직접 웨브 형성 제조 장비를 사용함으로써, 개시된 웨브 및 매트릭스는 매우 경제적으로 제조될 수 있다. By using the fiber-forming polymeric material is one essentially forming webs directly be converted into a web in a straightforward task manufacturing equipment, as disclosed webs and matrices can be produced very economically. 또한, 매트릭스 섬유가 모두 동일한 중합체 조성을 갖고 외부 결합 재료가 이용되지 않는다면, 매트릭스는 완전히 재생될 수 있다. Further, if the matrix fibers all have the same polymer composition of the outer bonding material is not used, the matrix may be fully regenerated. 본 발명의 이러한 태양 및 다른 태양들은 하기의 상세한 설명으로부터 명백해질 것이다. These and other aspects of the present invention will become apparent from the following detailed description. 그러나, 어떠한 경우에도, 상기 개요는 출원 절차 중에 보정될 수 있는 첨부된 청구의 범위에 의해서만 제한되는 본 발명의 보호 대상에 대한 제한으로서 해석되어서는 안 된다. However, in any case, the Summary should not be construed as a limitation to the protected object of the invention is limited only by the scope of the appended claims that can be corrected during the application procedure. 도 1은 주름진 여과 매체의 사시도. 1 is a perspective view of pleated filtration media. 도 2는 용융 방사법 및 급랭 강제 유동 히터를 사용하여 주름질 수 있는 1성분 단층 웨브를 제조하기 위한 예시적인 공정의 개략적인 측면도. Figure 2 is a side view schematic of an exemplary process for making a one-component monolayer webs which can be pleated using a melt-spinning method and quench forced flow heater. 도 3은 도 2에 도시된 장치의 열처리부의 사시도. Figure 3 is a perspective view of the heat treatment portion of the apparatus shown in Fig. 도 4는 도 3의 장치의 개략적인 확대도. Figure 4 is an enlarged schematic of the apparatus of Fig. 첨부 도면의 다양한 도면들 내의 유사한 도면 부호는 유사한 요소를 나타낸다. Like reference numerals in the various figures of the accompanying drawings indicate like elements. 도면 내의 요소들은 축척에 따라 도시하지는 않았다. The elements in the figures were not shown to scale. "다공성"이라는 용어는 공기 투과성을 의미한다. The term "porous" refers to the air permeability. "1성분"이라는 용어는 섬유 또는 섬유 집합체에 대해서 사용될 때 그 단면을 가로질러 본질적으로 동일한 조성을 갖는 섬유를 의미하고, 1성분은 균일한 조성의 연속상이 섬유의 단면을 가로질러 그리고 그 길이에 걸쳐 연장하는 블렌드(즉, 중합체 합금) 또는 첨가제 함유 재료를 포함한다. The term "first component" when used with respect to the fiber or the fiber aggregate that across the cross-section width means a fiber having the same composition as in essence, the first component and across the cross-section of the continuous phase is fiber having a uniform composition throughout its length It includes extending the blend (i.e., polymer alloys) or additive-containing materials. "동일한 중합체 조성의"라는 용어는 본질적으로 동일한 반복 분자 단위를 갖지만, 분자량, 용융 지수(melt index), 제조 방법, 상업적 형태 등에 있어서 상이할 수 있는 중합체를 의미한다. The term "in the same polymer composition" will have the same repeating molecular unit in essence, the molecular weight refers to a polymer which can be different in melt index (melt index), method of manufacture, commercial form, etc..
"결합"이라는 용어는 섬유 또는 섬유 집합체에 대해서 사용될 때 함께 견고하게 접착하는 것을 의미하고, 결합된 섬유들은 대체로 웨브가 통상적인 취급을 받을 때 분리되지 않는다. "Bond" as used herein is not meant to separate when fixedly attached together when they are used for the fibers or fiber aggregate, and the combined fibers are generally web is subjected to conventional handling. "부직 웨브"라는 용어는 섬유들의 엉킴 또는 점 결합을 특징으로 하는 섬유 웨브를 의미한다. The term "nonwoven web" means a fibrous web characterized by entanglement or point bonding of the fibers. "단층 매트릭스"라는 용어는 섬유의 부직 웨브에 대해서 사용될 때 단면 전체에 걸쳐 유사한 섬유들의 대체로 균일한 분포를 갖는 것을 의미한다. "Single-layer matrix," the term is meant having a generally uniform distribution of similar fibers throughout the entire cross-section when it is used for non-woven webs of fiber. "크기"라는 용어는 섬유에 대해서 사용될 때 원형 단면을 갖는 섬유의 경우에는 섬유 직경을, 또는 비원형 단면을 갖는 섬유를 가로질러 구성될 수 있는 단면 상의 최장 현(chord)의 길이를 의미한다. The term "size" is the case of fiber having a circular cross section when it is used with respect to fibers means the length of a fiber diameter, or a non-circular longest chord (chord) on the end face with the fiber having the cross section can be configured across. "연속적인"이라는 용어는 섬유 또는 섬유 집합체에 대해서 사용될 때 본질적으로 무한한 종횡비(즉, 예컨대 크기에 대한 길이의 비가 적어도 약 10,000 이상인 비)를 갖는 섬유를 의미한다. The "continuous" as used herein, means a fiber having an essentially infinite aspect ratio (i.e., ratio or higher ratio of at least about 10,000, for example of length to size) when used for fiber or fiber aggregate. "유효 섬유 직경"이라는 용어는 섬유 집합체에 대해 사용될 때 원형 또는 비원형인 임의의 단면 형상의 섬유 웨브의 경우 문헌[Davies, CN, "The Separation of Airborne Dust and Particles", Institution of Mechanical Engineers, London, Proceedings 1B, 1952]에 설명되어 있는 방법에 따라 결정된 값을 의미한다. "Effective fiber diameter" term when used for the fiber assembly for round or non-round in a random fiber web of the cross-sectional shape literature [Davies, CN, "The Separation of Airborne Dust and Particles", Institution of Mechanical Engineers, London means the value determined according to the method described in Proceedings 1B, 1952]. "필라멘트를 섬유로 세장화한다"는 용어는 필라멘트의 세그먼트의 더 큰 길이 및 더 작은 크기의 세그먼트로의 변환을 의미한다. "The three boots filaments into fibers", the term refers to the conversion of a greater length and a smaller segment of the filament segments. "멜트스펀"이라는 용어는 부직 웨브에 대해서 사용될 때 복수의 오리피스를 통해 저점도 용융물을 압출하여 필라멘트를 형성하고, 필라멘트를 공기 또는 다른 유체를 이용하여 급랭시켜 적어도 필라멘트의 표면을 고화시키고, 적어도 부분적으로 고화된 필라멘트를 공기 또는 다른 유체와 접촉시켜 필라멘트를 섬유로 세장화하고, 세장화된 섬유의 층을 수집함으로써 형성된 웨브를 의미한다. The term "melt-spun" is by quenching using a plurality of orifices for through low viscosity air for extruding the melt to form a filament, the filament or other fluids, when used for the nonwoven web and solidifying the surface of at least a filament, at least in part, the solidified filament or three air boots the filament is brought into contact with another fluid in the fibers, and means a web formed by collecting a layer of the aged fiber boots. "멜트스펀 섬유"라는 용어는, 다이로부터 나와서, 섬유를 영구적으로 인발하고 섬유 내의 중합체 분자를 섬유의 종축과 정렬되도록 영구적으로 배향시키는 처리 스테이션을 통해 이동하는 섬유를 의미한다. The term "melt spun fibers" is meant fibers which come out from the die, moving through a processing station for drawing the fiber permanently and permanently oriented in the polymer molecules within the fiber to align with the longitudinal axis of the fiber. 그러한 섬유는 본질적으로 연속적이고, 하나의 완전한 멜트스펀 섬유를 그러한 섬유의 집합체로부터 제거하는 것이 보통 가능하지 않을 만큼 충분히 엉켜 있다. Such fibers are essentially continuous, entangled, one complete melt spun fibers as well as not to be normally removed from the assembly of such fibers. "배향된"이라는 용어는 중합체 섬유 또는 그러한 섬유의 집합체에 대해서 사용될 때 세장화 챔버 또는 기계식 인발 기계와 같은 장비를 섬유가 통과한 결과 섬유의 중합체 분자들 중 적어도 일부가 섬유의 길이 방향으로 정렬되는 것을 의미한다. The term "oriented" is that at least some of the polymer fibers or when used for the assembly of such fiber three boots chamber or mechanical drawing machine and equipped with a resulting polymer molecules of the fibers, the fibers are passed through the same alignment in the longitudinal direction of the fiber It means. 섬유 내의 배향의 존재는 복굴절성 측정 또는 광각 x-선 회절을 비롯한 다양한 방법에 의해 검출될 수 있다. The presence of orientation in fibers can be detected by various methods, including birefringence measurements or wide-angle x- ray diffraction. 중합체 또는 중합체 섬유에 대한 "공칭 융점"(Nominal Melting Point)이라는 용어는 중합체 또는 섬유의 용융 영역 내에서, 그러한 영역 내에 단지 하나의 최대치만이 있다면, 2차 가열, 전열 유동(total-heat-flow) 시차 주사 열량계(DSC) 플롯의 피크 최대치를 의미하고; The term "nominal melting point" for polymers or polymeric fibers (Nominal Melting Point) is if there is only one maximum value in the in the melting region of the polymer or fiber, such a zone, the second heating, the heat transfer fluid (total-heat-flow ) differential scanning calorimeter (DSC) and refers to the maximum peak of the plot; (예컨대, 2개의 별개의 결정상의 존재 때문에) 하나 초과의 융점을 나타내는 하나 초과의 최대치가 있다면, 최고 진폭 용융 피크가 발생하는 온도를 의미한다. If the maximum value of (e. G., Due to the presence on the two distinct crystal) more than one showing a melting point of greater than one, means the temperature at which the maximum amplitude melting peak occurs. "자발 결합"(autogenous bonding)이라는 용어는 점 결합 또는 캘린더링에서와 같이 확실한 접촉 압력의 가함이 없이 오븐 내에서 또는 쓰루-에어 본더(through-air bonder)에 의해 얻어지는 바와 같은 상승된 온도에서의 섬유들 사이의 결합을 의미한다. "Spontaneous combined" term (autogenous bonding) is point bonded or in the oven without infliction of solid contact pressure such as in calendering or through-in air bonder an elevated temperature as obtained by (through-air bonder) It means a bond between the fibers. "마이크로 섬유"라는 용어는 10 ㎛ 이하의 (현미경을 사용하여 측정되는) 중간 크기를 갖는 섬유를 의미하고, "초미세 마이크로 섬유"는 2 ㎛ 이하의 중간 크기를 갖는 마이크로 섬유를 의미하고, "서브마이크로미터(submicron) 마이크로 섬유"는 1 ㎛ 이하의 중간 크기를 갖는 마이크로 섬유를 의미한다. "Microfibers," as used herein refers to fibers having an intermediate size (as measured using a microscope) of less than 10 ㎛, and "ultrafine microfiber" means a microfiber having a medium size less than 2 ㎛, and " submicrometer (submicron) microfiber "means a microfiber having a medium size less than 1 ㎛. 본 명세서에서 특정 종류의 마이크로 섬유의 배치(batch), 그룹(group), 어레이(array) 등, 예컨대 "서브마이크로미터 마이크로 섬유의 어레이"를 참조할 때, 이는 서브마이크로미터 치수인 어레이 또는 배치의 그러한 일부가 아니라, 그러한 어레이 내의 마이크로 섬유들의 완전한 집단 또는 마이크로 섬유들의 단일 배치의 완전한 집단을 의미한다. When referring to, for example, "the sub-arrays of micrometer-microfibers," such as the arrangement of micro-fibers of a particular type (batch), group (group), the array (array) in the present specification, which of the array or batch submicrometer dimensions as such a part, it means the complete population of a single batch of microfibers, or the complete population of microfibers in that array. "대전된"이라는 용어는 섬유 집합체에 대해서 사용될 때, 7 ㎝/s의 면 속도에서 퍼센트 다이옥틸 프탈레이트(% DOP) 투과율에 대해 평가할 때 1 ㎜ 베릴륨-필터링된 80 KVp X-선의 20 그레이(Gray) 흡수 선량에 노출된 후에 (후술하는) 품질 계수(QF, Quality Factor)의 적어도 50% 손실을 보이는 섬유를 의미한다. The term "charged" when used with respect to a fiber aggregate, 7 ㎝ / s 1 ㎜ beryllium when evaluated for percent dioctyl phthalate (% DOP) transmission in speed of the-filtered 80 KVp X- line 20 gray (Gray ) means the fibers exhibit at least a 50% loss of the later (later-described), the quality factor (QF, quality factor) exposed to the absorbed dose. "자립식"이라는 용어는 단층 매트릭스에 대해서 사용될 때 그러한 매트릭스를 함유하는 주름 필터 요소가 필터 요소의 선택된 부분을 강화하기 위해 선단 안정부(tip stabilization)(예컨대, 평면의 와이어 면 층) 또는 주연 보강부(perimeter reinforcement)(예컨대, 모서리 접착제 또는 필터 프레임)를 포함할 수 있더라도, 매트릭스가 와이어, 메시 또는 다른 강화 재료의 인접 보강 층을 포함하지 않는 것을 의미한다. "Freestanding" as used herein, when used for a single-layer matrix pleated filter element tip stabilizer (tip stabilization) to strengthen selected portions of the filter element containing such a matrix (e. G., Wire side of the plane layer) or the peripheral reinforcement Although it is possible to include a portion (perimeter reinforcement) (for example, an adhesive or a filter corner frame), means that the matrix does not contain a contiguous reinforcing layer of wire mesh or other reinforcing material. 도 1은 이격된 주름(4)들의 열로 형성된 개시된 1성분 단층 웨브(2)로부터 제조된 예시적인 주름 필터(1)를 사시도 형태로 도시한다. 1 illustrates an exemplary pleated filter (1) made from a one-component single layer web (2) formed as disclosed columns of spaced-apart folds (4) in a perspective view form. 본 기술 분야의 숙련자는 필터(1)가 그대로 사용될 수 있거나, 필터(1)의 선택된 부분이 (예컨대, 평면의 확장된 금속 면 층, 고온 용융 접착제의 보강선, 접착 결합된 보강 바아 또는 다른 선택적인 보강 지지체를 이용하여) 안정되거나 보강될 수 있고, 선택적으로 적합한 프레임(예컨대, 금속 또는 판지 프레임) 내에 장착되어 예컨대 HVAC 시스템에서 사용하기 위한 교체 가능한 필터를 제공할 수 있다는 것을 이해할 것이다. Those skilled in the art is a filter (1) as may be used, the selected portion of the filter (1) (e. G., Expanded metal surface of the flat layer, and the reinforcing lines of hot melt adhesive, the adhesive-bonded reinforcing bar or other selection of can be used a reinforcing support) or stable reinforcement, is mounted in a selectively appropriate frame (e.g., metal or cardboard frame), it will be appreciated that it is possible for example to provide a replaceable filter for use in the HVAC system. 주름진 웨브(2)는, 단독으로 취해졌을 때, 주름(4)을 형성하는 것을 보조하고, 주름 형성 후에는 주름(4)이 높은 필터 면 속도에서 변형에 저항하는 것을 보조하는, 향상된 강성을 갖는 다공성 단층 매트릭스를 형성한다. Corrugated web (2), when taken alone, or assist in forming the folds (4), and crimping after the folds (4) having an improved stiffness to assist in resisting deformation at high filter face velocity to form a porous single-layer matrix. 1성분 단층 웨브(2) 이외에, 필터(1)의 구성에 관한 추가의 상세 사항은 본 기술 분야의 숙련자에게 친숙할 것이다. In addition to one-component single layer web (2), further details of the construction of the filter 1 information will be familiar to those skilled in the art. 개시된 1성분 단층 웨브는 적어도 약 100 ㎎의 주름 형성 전 걸리 강성(Gurley Stiffness)을 갖고, 적어도 약 200 ㎎ 또는 적어도 약 300 ㎎의 주름 형성 전 걸리 강성을 가질 수 있다. One-component single layer webs disclosed can have a Gurley stiffness of at least about 100 ㎎ take blank-I has a stiffness (Gurley Stiffness), at least before crimping of about 200 ㎎ or at least about 300 ㎎. 웨브는 다양한 유효 섬유 직경 및 평량, 예를 들어 약 8 내지 약 40 ㎛의 유효 섬유 직경(EFD) 및 약 50 내지 약 300 g/㎡ 또는 약 65 내지 약 250 g/㎡ 의 평량을 가질 수 있다. The web may have a variety of effective fiber diameter and basis weight of, for example, a basis weight of about 8 to about 40 ㎛ of effective fiber diameter (EFD) and from about 50 to about 300 g / ㎡ or about 65 to about 250 g / ㎡. 13.8 ㎝/s 의 면 속도에서 그리고 DOP 챌린지(challenge)를 사용하여 평가될 때, 편평 웨브는 바람직하게는 적어도 약 0.3, 더 바람직하게는 적어도 약 0.4의 초기 여과 품질 계수(QF)를 갖는다. When in speed of 13.8 ㎝ / s and be evaluated using a DOP challenge (challenge), the flat web preferably has an initial filtration quality factor (QF) of at least about 0.3, more preferably at least about 0.4. 주름 형성 후에, 개시된 1성분 단층 매트릭스는 1.52 m/s (300 ft/min)의 면 속도에서 적어도 약 15%의 평균 초기 서브마이크로미터 효율을 갖고, 적어도 약 25% 또는 적어도 약 50%의 평균 초기 서브마이크로미터 효율을 가질 수 있다. After crimping, the disclosed one-component single layer matrix is ​​1.52 m / s (300 ft / min) at least about 15% of the average has an initial sub-micrometer efficiency, average initial at least about 25% or about 50% at least in the surface speed of the sub may have a micrometer efficiency. 개시된 1성분 단층 웨브는 동일한 중합체 조성의 부분적으로 결정질이며 부분적으로 비정질인 배향된 섬유들을 함유한다. One-component single layer webs disclosed is a partially crystalline polymer of the same composition containing the partially amorphous oriented fibers. 부분적으로 결정질인 배향된 섬유들은 또한 반결정질의 배향된 섬유로도 불릴 수 있다. Partially crystalline oriented fibers may also be referred to as a semi-crystalline oriented fibers. 반결정질 중합체의 부류는 잘 정의되어 있으며 잘 알려져 있고, 검출 가능한 결정 배열(crystalline order)을 갖지 않는 비정질 중합체와는 구별된다. Class of semicrystalline polymers is well defined and well known and is distinguished from amorphous polymers with no detectable crystal arrangement (crystalline order). 결정성의 존재는 시차 주사 열량 측정법, x-선 회절, 밀도 및 다른 방법에 의해 쉽게 검출될 수 있다. Presence of crystallinity can be readily detected by differential scanning calorimetry, x- ray diffraction, density and other methods. 종래의 배향된 반결정질 중합체 섬유는 2개의 상이한 종류의 분자 영역 또는 상, 즉 고도로 배열되거나 변형 유도된 결정질 도메인의 비교적 많은 존재를 특징으로 하는 제1 종류의 상, 및 더 낮은 결정 배열의(예컨대, 사슬 연장되지 않은) 도메인 및 비정질인 도메인의 비교적 많은 존재를 특징으로 하는 제2 종류의 상을 갖는 것으로 간주될 수 있지만, 후자는 결정성에 대해 불충분한 정도의 약간의 배열 또는 배향을 가질 수 있다. Conventional oriented semicrystalline polymeric fibers are two different kinds of molecular regions or phase, namely the highly arrangement or modified induce a first kind of phase that is characterized by a relatively large presence of crystalline domains, and a lower crystal arrangement (e.g. , but can be considered to have a second kind of phase that is characterized by a relatively large presence of the chain is not extended) domain and an amorphous domain, the latter may have some of the arrangement or orientation of a sufficient degree for the crystallinity . 명확한 경계를 가질 필요가 없으며 서로 혼합하여 존재할 수 있는 이러한 2가지 상이한 종류의 상들은 상이한 종류의 특성을 갖는다. It is not necessary to have a clear boundary these two different types of phase which can be mixed with each other have different kinds of properties. 상이한 특성은 상이한 용융 또는 연화 특징을 포함한다, 즉 고도로 배열된 결정질 도메인의 더 많은 존재를 특징으로 하는 제1 상은 제2 상이 용융 또는 연화되는 온도(예컨대, 보다 낮은 배열의 결정질 도메인의 융점에 의해 변경되는 비정질 도메인의 유리 전이 온도)보다 높은 온도(예컨대, 사슬 연장된 결정질 도메인의 융점)에서 용융된다. Different properties include different melting or softening characteristics, that is, the first to the highly characteristic for more presence of the array of crystalline domains phase is a second temperature that is different from the molten or softened (e.g., by the melting point of the crystalline domains of the lower arrays higher than the glass transition temperature) of the amorphous domain to change temperature (for example, the melting point of the chain extended crystalline domain) is melted at. 본 명세서에서 설명의 편의를 위해, 제1 상은 그 용융 특징이 더 높은 배열의 미소결정(crystallite)의 존재에 의해 더 강하게 영향을 받아서 미소결정이 존재하지 않을 때보다 더 높은 융점을 상에 부여하기 때문에 본 명세서에서 "미소결정 특징 상"(crystallite-characterized phase)으로 불리고, 제2 상은 비정질 분자 도메인에 의해 영향을 받거나 더 낮은 배열의 결정질 도메인으로 산재된 비정질 재료의 더 낮은 온도에서 연화되기 때문에 "비정질 특징 상"(amorphous-characterized phase)으로 불린다. For convenience of description herein, the first phase is to impart to the higher melting point than the melting characteristics are more crystallites does not exist, receiving the more strongly affected by the presence of crystallites (crystallite) of the high array since referred to herein as "crystallite features a" (crystallite-characterized phase), the second phase because the softening at a lower temperature of the amorphous material interspersed with crystalline domains of the lower array affected or by amorphous molecular domains " characterized amorphous phase is referred to as "(amorphous-characterized phase). 배향된 반결정질 중합체 섬유의 결합 특징은 2가지 상이한 종류의 분자 상의 존재에 의해 영향을 받는다. Binding characteristics of an oriented semicrystalline polymeric fibers are influenced by the existence of two different types of molecules. 반결정질 중합체 섬유가 종래의 결합 작업에서 가열될 때, 가열 작업은 예컨대 기존의 결정 구조 상으로의 분자 물질의 부가 또는 배열된 비정질 부분의 추가 배열을 통해, 섬유의 결정성을 증가시키는 효과를 갖는다. When the semicrystalline polymeric fibers are heated in a conventional bonding operation, the heating operation for example has the effect of using an additional arrangement of the additional or arranged amorphous portion of the molecule onto the existing crystal structure, increase the crystallinity of the fiber . 비정질 특징 상 내의 더 낮은 배열의 결정질 재료의 존재는 그러한 결정 성장을 증진시키고, 더 낮은 배열의 결정질 재료가 첨가됨에 따라 이를 증진시킨다. The presence of crystalline material of the lower array in the amorphous characteristics promotes it as promote such crystal growth and, the addition of more crystalline material of low array. 더 낮은 배열의 결정성의 증가 결과는 결합 작업 중에 섬유의 연화 및 유동성을 제한하는 것이다. Increase resulting crystallinity of the lower arrangement is to limit softening and flowability of the fibers during the binding operation. 배향된 반결정질 중합체 섬유를 제어된 가열 및 급랭 작업을 받게 하였고, 이 때 섬유와 설명된 상이 형태학적으로 정련되어 섬유에 새로운 특성 및 유용성을 부여한다. Was subjected to the control of the oriented semi-crystalline polymer fiber heating and quenching operation, at this time, the fiber is refined with the described different morphological impart new properties and utility in the fiber. 이러한 가열 및 급랭 작업시, 섬유는 흔히 섬유를 만드는 중합체 재료의 공칭 융점만큼 높거나 그보다 높은 상당히 높은 온도에서 짧은 제어된 시간 동안 먼저 가열된다. This heating and rapid cooling during operation, the fibers are often heated to increase as the nominal melting point of the polymer material for fibers or for a first rather short controlled time at a high temperature significantly higher. 대체로, 가열은 결정질 특징 상이 용융되지 않고 유지되는 동안 섬유의 비정질 특징 상이 용융 또는 연화되기에 충분한 시간 동안 그리고 소정 온도에서 행해진다 (비정질 특징 상의 비정질 부분이 대체로 유리 전이 온도에서 연화되는 것으로 간주되고, 결정질 부분이 융점에서 용융되기 때문에 "용융 또는 연화"라는 용어를 사용하고, 웨브를 가열하여 구성 섬유의 비정질 특징 상 내의 결정질 재료의 용융을 일으키는 열처리를 선호한다). In general, the heating is considered to be softened at a time sufficient for and made it (the amorphous portion on the amorphous characteristics substantially the glass transition temperature at a predetermined temperature to become amorphous characteristics different from the fibers melted or softened during the maintenance are not crystalline characteristics different from melt, since the crystalline portion to melt at the melting point use a "melting or softening" term, and by heating the web like the heat treatment that causes the melting of crystalline material in the amorphous characteristics of the component fibers). 설명된 가열 단계에 이어, 가열된 섬유는 즉시 그리고 급속히 냉각되어 정련되거나 정제된 형태학적 형상으로 급랭 및 동결된다. Following the described heating step, the heated fibers are immediately and rapidly cooled and frozen by the rapid cooling is refined or purified morphological form. 가장 광범위한 관점에서, 본 명세서에서 사용되는 바와 같은 "형태학적 정련"은 배향된 반결정질 중합체 섬유의 형태(morphology)를 단순히 변화시키는 것을 의미하지만, 처리된 섬유의 정련된 형태학적 구조를 이해한다 (약간의 이론적인 고려를 대체로 수반하는 "이해"에 대한 본 명세서에서의 설명에 의해 구속되는 것은 바라지 않는다). And most in broad perspective, "morphological refining" as used herein is meant to simply change the shape (morphology) of the oriented semi-crystalline polymer fiber, but to understand the morphological structure refining of the treated fibers ( It is bound by the description herein of the "understanding" that generally involve some theoretical considerations do not wish). 비정질 특징 상에 관해서는, 바람직하지 않은 (연화 방해) 결정 성장에 민감한 상의 분자 물질의 양은 처리 전만큼 많지 않다. As for the amorphous characteristics are undesirable (softening interference) is not much by the amount of molecular material before treatment on the crystal growth sensitive. 이러한 변화된 형태학적 특징의 한 가지 증거는, 결합 작업 시에 가열되는 종래의 배향된 반결정질 중합체 섬유가 (예컨대, 전술한 바와 같이, 섬유의 연화성 및 결합성(bondability)을 제한하는, 기존의 더 낮은 배열의 결정 구조 상으로의 부가 또는 배열된 비정질 부분의 추가 배열을 통해) 원하지 않는 결정성의 증가를 겪지만, 처리된 섬유는 종래의 미처리 섬유보다 훨씬 더 큰 정도로 연화 및 결합 가능하게 유지된다는 사실이고, 흔히 이들은 섬유의 공칭 융점보다 낮은 온도에서 결합될 수 있다. Same evidence of this changed morphological characteristics, as is conventional oriented semicrystalline polymeric fibers are heated during the bonding operation (for example, described above, to limit the edge of a fiber resistance and bonding properties (bondability), conventional further with additional or more arrays of the array, the amorphous portion of the phase crystal structure of the lower array) but suffer from the unwanted crystal growth castle that, the treated fibers that soften and bond can be maintained at a much greater than conventional untreated fibers in fact, and often it can be combined at a temperature lower than the nominal melting point of the fibers. 비정질 특징 상은 열 결합 작업 중에 종래의 미처리 섬유 내에서의 결정성의 바람직하지 않은 증가로 이어졌을 형태학적 구조의 일종의 제거 또는 감소를 겪었다는 것을 알게 되고, 예컨대 형태학적 형상의 다양성 또는 분포가 감소되었고, 형태학적 구조가 단순화되었고, 형태학적 구조의 더 구분 가능한 비정질 특징 상과 미소결정 특징 상으로의 일종의 분정 작용(segregation)이 발생하였다. Amorphous characterized phase thermal bonding is found that has undergone followed been morphological structure sort of removal or reduction of a crystal increases undesired resistance of in conventional untreated fibers during the operation, for example, decreased the variety or distribution of morphological shape, the morphological structure has been simplified and is more distinguishable features amorphous phase and a kind of segregation (segregation) of the crystallite characteristics of the morphological structure occurred. 처리된 섬유는 일종의 "반복성 연화"가 가능하고, 이는 섬유, 및 특히 섬유의 비정질 특징 상이 섬유가 전체 섬유의 용융을 일으키는 것보다 더 낮은 온도 영역 내에서 상승 및 하강되는 온도의 사이클에 노출됨에 따라 연화 및 재고형화의 반복 사이클을 어느 정도 겪을 것이라는 것을 의미한다. The treated fibers in accordance with the exposure to a temperature cycle in which a kind of "repeatable softening" is available, which rise and fall in a lower temperature region than the fiber, and in particular amorphous characteristics different fibers of the fiber to cause the melting of the whole fiber It means the repeated cycles of softening and inventory typed degree will suffer. 실질적인 측면에서, 그러한 반복성 연화는 (가열 및 급랭 처리의 결과로서 유용한 정도의 결합을 이미 대체로 보이는) 처리된 웨브가 가열되어 추가의 자발 결합을 일으킬 수 있을 때 나타난다. In practical terms, such repeatable softening is heated (generally already seen the combination of useful degree as a result of the heating and quenching treatment), the treated web when you can cause a spontaneous combination of more. 연화 및 재고형화의 사이클은 무한하게 계속되지 않을 수 있지만, 섬유의 웨브가 응집성이고 취급 가능하도록 섬유가 초기에 열 결합되고, 필요하다면 다시 가열되어 캘린더링 또는 다른 원하는 작업을 수행하고, 3차원 재성형 작업을 수행하도록 다시 가열되어 비평면 형상을 형성(예컨대, 주름 필터 요소를 형성)할 수 있으면 보통 충분하다. But may cycle of softening and inventory type forming is not continue indefinitely, and the fibers are thermally connected to the initial of the fiber web cohesion and to be treated, it is further heated, if necessary perform a calendaring or other desired operations, and the three-dimensional material if you are able to be re-heated to carry out the forming operation to form a nonplanar shape (e.g., to form a pleated filter elements) it is usually sufficient. 따라서, 웨브가 섬유의 공칭 융점보다 낮은 온도에서 자발 결합을 나타낼 수 있도록 가열 및 급랭 작업 시에 1성분 단층 웨브를 형태학적으로 정련하고, 웨브를 주름으로 형성하고, 적어도 일부의 섬유 교차점에서 서로 결합되며 전술한 바와 같은 평균 초기 서브마이크로미터 효율을 갖는 섬유의 자립식 다공성 1성분 단층 매트릭스를 포함하는 주름 필터 요소로 웨브를 지속적으로 변환(즉, 재성형)하는 데 효과적인 성형 온도에 웨브를 노출시킬 수 있다. Thus, the web is polished for one-component single layer web upon heating and quenching operation to indicate a spontaneous bond at a nominal temperature lower than the melting point of the fiber morphologically, and form a web in folds and at least coupled to each other in some fiber crossing of and exposing the web to an effective molding temperature to the average initial sub-transformation the web continuously to a pleated filter element comprising a freestanding porous one-component monolayer matrix of fibers having a micrometer efficiency (that is, the re-compaction) as previously described can. 바람직하게는, 그러한 재성형은 섬유의 중합체 재료의 공칭 융점보다 적어도 10℃ 낮은 온도, 예컨대 공칭 융점보다 15℃ 또는 심지어 30℃ 낮은 온도에서 수행될 수 있다. Preferably, such a material comprising at least 10 ℃ than the nominal melting point of the polymer material of the fibers may be carried out at a low temperature, for example 15 or even 30 ℃ ℃ temperature lower than the nominal melting point. 낮은 재성형 온도가 가능하더라도, 다른 이유로, 웨브는 예컨대 웨브를 압축시키거나 섬유를 어닐링 또는 열 경화시키기 위해 더 높은 온도에 노출될 수 있다. Even if a low reshaping temperature is possible, for other reasons, the web may be exposed to higher temperatures for example to compress the web or to anneal or thermally cure the fiber. 섬유들의 결합을 달성하는 데, 예컨대 섬유의 연화 및 결합하는 재료를 제공하는 데 비정질 특징 상의 역할이 주어지면, 때때로 비정질 특징 상을 "결합" 상으로 부른다. To achieve a combination of fibers such as having given the role on the amorphous characteristics which provide softening and bonding material of the fibers, sometimes called an amorphous phase characterized as a "combination". 섬유의 미소결정 특징 상은 자신의 상이한 역할을 가져서, 즉 섬유들의 기본 섬유 구조를 보강한다. Crystallite of the fiber phase is characterized gajyeoseo their own different role, namely to reinforce the basic fiber structure of the fiber. 미소결정 특징 상은 대체로 그 융점이 비정질 특징 상의 융점/연화점보다 높기 때문에 결합 등의 작업 중에 용융되지 않고 유지될 수 있고, 따라서 섬유 전체에 걸쳐 연장하여 섬유 구조 및 섬유 치수를 지지하는 온전한 매트릭스로서 유지된다. Crystallite characterized phase generally, and its melting point can be maintained not melt during the operation, such as bonding is higher than the melting point / softening point on the amorphous characteristics, so as to extend over the entire fiber is held as a whole a matrix which supports the fiber structure and fiber dimensions . 따라서, 자발 결합 작업 시에 웨브를 가열함으로써 섬유 교차점에서 약간의 유동을 겪어 근접 접촉하거나 또는 하나로 합쳐지게 되어 섬유가 함께 접합될 것이지만, 기본적인 개별 섬유 구조는 교차부들과 결합부들 사이에서 섬유의 길이에 걸쳐 유지되고, 바람직하게는, 섬유의 단면은 작업 중에 형성된 교차부 또는 결합부들 사이에서 섬유의 길이에 걸쳐 변하지 않고 유지된다. Thus, a spontaneous bond by heating the web at the time of work is be undergoing some flow close contact or merged together at fiber intersection points, but the fiber are joined together, the basic discrete fiber structure is a length of the fibers between the bond and the cross-Purupuru over and held, preferably, in the fiber cross-section it is kept unchanged over the length of the fibers between intersections or coupling portions formed during the operation. 유사하게는, 처리된 웨브를 캘린더링함으로써 캘린더링 작업의 압력 및 열에 의해 섬유가 재구성될 수 있지만 (이럼으로써, 섬유들이 캘린더링 중에 그 위로 가압된 형상을 영구적으로 유지하게 하고, 웨브의 두께를 더 균일하게 하지만), 섬유들은 대체로 원하는 웨브 다공성, 여과, 및 절연 특성을 결과적으로 보유하는 개별 섬유들로서 유지된다. Similarly, the processed web by calendering may be fibers are reconfigured by the pressure of the calendering operation, and the heat, but (as takin, fiber to the calendering that make up permanently maintained in a pressurized form, and web thickness of the However, more uniform), the fibers are maintained substantially as a result of individual fibers retain the desired web porosity, filtration, and insulating properties. 설명된 바와 같이 미소결정 특징 상의 보강 역할이 주어지면, 때때로 이를 "보강"(reinforcing) 상 또는 "유지"(holding) 상으로 부른다. Given the reinforcing role on the crystallite characteristics as described, at times referred to this as the "reinforcement" (reinforcing) or a "holding" (holding). 미소결정 특징 상은 또한 예를 들어 더 높은 배열의 결정질 구조의 양을 변화시키기 위해 처리 중에 형태학적 정련을 겪는 것으로 이해된다. Crystallite characterized phase also is understood that, for example undergo morphological refinement during treatment in order to further change the amount of the crystalline structure of the high array. 도 2 내지 도 4는 바람직한 1성분 단층 웨브를 제조하기 위해 사용될 수 있는 공정을 도시한다. FIG 2 to FIG 4 illustrates a process that may be used to prepare the preferred one-component single layer web. 이러한 공정 및 이렇게 제조된 부직 웨브에 관한 추가의 상세 사항은 2006년 7월 31일자로 출원되고 발명의 명칭이 "연화 가능한 배향된 반결정질 중합체 섬유를 포함하는 결합된 부직 섬유 웨브 및 그러한 웨브를 제조하기 위한 장치 및 방법"인 미국 특허 출원 제11/461,201호에 도시되어 있다. Such a process, and thus further details, this application is entitled & July 31, 2006 prepared a non-woven fiber web and such web combined with a "softening possible the oriented semicrystalline polymeric fibers on the produced nonwoven web apparatus and method for it is shown in "US Patent Application No. 11/461 201 call. 간략하게 요약하면, 본 발명에 적용되는 바와 같이, 이러한 바람직한 기술은 비정질 특징 상을 포함하는 배향된 반결정질 멜트스펀 섬유의 수집된 웨브가, a) 전체 섬유를 용융시키기에는 (즉, 그러한 섬유가 개별 섬유 성질을 상실하게 하기에는) 너무 짧은 시간 (바람직하게는, 가열 시간은 섬유 단면의 상당한 뒤틀림을 일으키기에는 너무 짧음) 동안 (그러한 섬유 재료의 개시 용융 온도보다 대체로 높은) 섬유의 비정질 특징 상을 연화시키기에 충분히 높은 온도로 가열된 유체를 웨브를 통해 강제로 통과시키고, b) 연화된 섬유를 고화시키기에 (즉, 열처리 중에 연화된 섬유의 비정질 특징 상을 고화시키기에) 충분한 열 용량을 갖는 유체를 웨브를 통해 강제로 통과시킴으로써 웨브를 즉시 급랭시키는 것을 포함하는 제어된 가열 및 급랭 작업을 받게 Briefly summarized, as applied to the present invention, this preferred technique is a semi-crystalline collected web of melt-spun fiber alignment, including the amorphous characteristics, a) that fit a melting the whole fiber (i. E., Such a fiber hagieneun lose their individual fibrous nature) too short period of time (preferably, the heating time fibers are too short to cause a significant distortion of the cross-section) (softening a generally high) the amorphous characteristics of the fiber onto the initiation melting temperature of such textile materials for sufficiently to pass to force the heated fluid to a temperature over the web, b) on to solidify the softened fibers having sufficient heat capacity (i.e., the to-solidifying amorphous characteristic phase of the softened fibers during heat treatment) fluid to receive a controlled heating and quenching operation that comprises immediately quenching the web by passing the web through a forced 는 것을 포함한다. Include that. 바람직하게는, 웨브를 통과한 유체는 기체 스트림이고, 바람직하게는 이 유체는 공기이다. Preferably, the fluid which has passed through the web the gas stream, and preferably the fluid is air. 이러한 맥락에서, 웨브를 통해 유체 또는 기체 스트림을 "강제로" 통과시키는 것은 정상 실압(room pressure)에 더하여 소정의 힘이 유체에 가해져 웨브를 통과해 유체를 추진하는 것을 의미한다. It is to pass in this context, a fluid or gaseous stream through a web "force" in addition to the normal silap (room pressure) The predetermined force is applied to the fluid meant to pass through the web and pushing the fluid. 바람직한 실시 형태에서, 개시된 급랭 단계는 가열된 기체를 웨브를 통해 흡인하는 것을 보조하기 위해 웨브의 타 측면 상에 기체 취출 장치가 있는 상태로, 압력 하에서 히터로부터 나와 웨브의 일 측면에 닿게 되는 집중되고 가열된 기체 (전형적으로, 공기) 스트림을 제공하는 (후술하는 바와 같이, 급랭식 유동 히터로 불릴 수 있는) 장치를 통해 컨베이어 상의 웨브를 통과시키는 것을 포함하고, 대체로 가열된 스트림은 (긴 슬롯 또는 직사각형 슬롯으로부터 발산하는 것과 같이) 나이프형 또는 커튼형이고, 웨브의 폭을 가로질러 연장하고, 균일하다 (즉, 온도 및 유동 면에서 균일성을 가져서 웨브 내의 섬유를 유용한 정도의 균일도로 가열한다). In a preferred embodiment, the disclosed quenching step in a state where the gas take-out apparatus on the other side of the web to assist in drawing in the heated gas through the web, is concentrated out under pressure from the heater that is exposed to the one side of the web with that by the heated gas (typically, air) (which may be referred to as, quench type flow heater as described below) to provide a stream device for passing the web on the conveyor, and substantially heated stream (long slots or and as emanating from a rectangular slot, as shown), knife-like or curtain-shaped, and extends across the width of the web, is uniform (i.e., it gajyeoseo the uniformity in the temperature and the flow surface to heat the fibers in the web to the uniformity of a useful degree) . 가열된 스트림은 몇몇 관점에서 "쓰루-에어 본더" 또는 "핫-에어 나이프"(hot-air knife)로부터의 가열된 스트림과 유사하지만, 유동을 조절하는 특수한 제어를 받아서 멜트스펀 섬유를 유용하게 높은 온도로 완전히, 균일하게 그리고 신속하게 가열 및 연화시키도록 가열된 기체가 웨브의 폭을 통해 균일하게 그리고 제어된 속도로 분포되게 할 수 있다. The heated stream is in some respects "through-air bonder", or similar to the heated stream from a "hot air knife" (hot-air knife), but receives a special control for controlling the flow usefully high a melt spun fiber completely at a temperature, a heated gas so as to uniformly and quickly heating and softening can be made uniform over the width of the web and distributed in a controlled rate. 가열에 바로 이어 강제 급랭되어 섬유를 정제된 형태학적 형상으로 신속하게 동결시킨다 ("즉시"는 동일한 작업의 일부라는 것, 즉 웨브가 후속 처리 단계 이전에 롤로 권취될 때 발생하는 저장의 개재 시간이 없다는 것을 의미한다). Will be called immediately after the quench forces thereby quickly freezing the purified fibers morphological shape ( "on the fly" are some of the same work in heated, that is, through the time of storage of the web is generated when the roll take-up prior to subsequent processing steps It means that). 바람직한 실시 형태에서, 기체 장치가 가열된 기체 스트림으로부터 웨브 하류에 위치되어, 웨브가 가열된 직후 냉각 기체 또는 다른 유체, 예컨대 주위 공기를 웨브를 통해 흡인하고, 이럼으로써 섬유를 신속하게 급랭시킨다. In a preferred embodiment, a gas apparatus is positioned in the web downstream from the heated gas stream, and the suction immediately after the web is heated cooling gas or other fluid, such as ambient air through the web, thereby rapidly quench the fibers by takin. 가열 길이는, 전체 섬유를 용융시키지 않으면서 비정질 특징 상의 의도된 용융/연화를 일으키도록, 예컨대 웨브 이동 경로를 따른 가열 영역의 길이에 의해 그리고 웨브가 가열 영역을 통해 냉각 영역으로 이동되는 속도에 의해 제어된다. Heated length, by the length of the heating region along the to cause the intended melting / softening of, for example, the web travel path on standing amorphous characteristics without melting the whole fiber, and by the speed at which the web is moved to the cooling zone through the heating zone It is controlled. 도 2를 참조하면, 중합체 섬유 형성 재료를 호퍼(11) 내로 도입하고, 압출기(12) 내에서 이 재료를 용융시키고, 용융된 재료를 펌프(13)를 통해 압출 헤드(10) 내로 펌핑함으로써, 섬유 형성 재료가 이러한 예시적인 장치 내에서 압출 헤드(10)로 이동된다. By 2, the introduction of the polymeric fiber-forming material into the hopper 11, and melting the material in an extruder 12, and pumping the molten material into the through pump 13, the extrusion head 10, the fiber-forming material is moved into the extrusion head 10 in this exemplary device. 펠릿 또는 다른 미립자 형태의 고체 중합체 재료가 가장 일반적으로 사용되고, 펌핑 가능한 액체 상태로 용융된다. The solid polymeric material in pellet or other particulate form most commonly used, is melted in a pumpable liquid state. 압출 헤드(10)는 규칙적인 패턴, 예컨대 직선 열로 배열된 다수의 오리피스를 일반적으로 포함하는 종래의 방사구(spinnerette) 또는 방사 팩(spin pack)일 수 있다. May be an extrusion head 10 has a regular pattern, e.g., straight conventional heat room that typically include a plurality of orifices arranged in four (spinnerette) or spinning pack (spin pack). 섬유 형성 액체의 필라멘트(15)가 압출 헤드로부터 압출되어 처리 챔버 또는 세장화기(16, attenuator)로 이송된다. The filaments 15 of the fiber-forming liquid are extruded from the extrusion head is conveyed to the process chamber, or an elongated weapon (16, attenuator). 세장화기는 예를 들어 미국 특허 제6,607,624 B2호(베리건 등)에 도시된 것과 같은 가동 벽 세장화기일 수 있다. Elongated weapon may, for example, the movable wall date three boots such as that shown in (such as berry s) U.S. Patent No. 6,607,624 B2. 필라멘트가 노출되는 조건이 변할 수 있는 바와 같이, 압출된 필라멘트(15)가 세장화기(16)에 도달하기 전에 이동하는 거리(17)가 변할 수 있다. As the conditions under which the filament is exposed may vary, the distance can be varied (17) to move before the extruded filament 15 reaches the elongated weapon (16). 공기 또는 다른 기체의 급랭 스트림(18)이 압출된 필라멘트에 제공되어 압출된 필라멘트(15)의 온도를 낮출 수 있다. This air stream or quench 18 of the other gas is provided in the extruded filaments can lower the temperature of the extruded filaments 15. 대안적으로, 공기 또는 다른 기체의 스트림은 가열되어 섬유의 인발을 용이하게 할 수 있다. Alternatively, a stream of air or other gas may be heated to facilitate drawing of the fibers. 공기 또는 다른 유체의 하나 이상의 스트림, 예컨대 압출 중에 방출되는 원하지 않는 기체 물질 또는 연기를 제거할 수 있는, 필라멘트 스트림에 대해 횡방향으로 송풍되는 제1 공기 스트림(18a)과, 원하는 대부분의 온도 감소를 달성하는 제2 급랭 공기 스트림(18b)이 있을 수 있다. The air or in one or more streams of different fluids, for example to remove unwanted gaseous materials or fumes that are emitted during the extrusion, the first air stream (18a) is blown in a lateral direction with respect to the filament stream, the desired, most of the temperature decrease there may be a second quenching air streams (18b) to achieve. 훨씬 더 많은 급랭 스트림이 사용될 수 있는데, 예를 들어 스트림(18b) 자체가 원하는 수준의 급랭을 달성하기 위한 하나 초과의 스트림을 포함할 수 있다. There are still more quenching streams may be used, for example, a stream (18b) itself may include more than one stream to achieve a desired level of quenching. 사용되는 공정 또는 원하는 최종 제품의 형태에 따라, 급랭 공기는 압출된 필라멘트(15)가 세장화기(16)에 도달하기 전에 이를 고화시키기에 충분할 수 있다. Depending on the type of process to be used or the desired end product, quenching air may be sufficient to solidify it before the extruded filament 15 reaches the elongated weapon (16). 다른 경우에, 압출된 필라멘트는 세장화기에 진입할 때까지 여전히 연화 또는 용융된 상태에 있다. In either case, the extruded filaments are still in a softened or molten state until it enters the elongated weapon. 대안적으로, 급랭 스트림이 사용되지 않으며, 그러한 경우에 압출 헤드(10)와 세장화기(16) 사이의 주위 공기 또는 다른 유체가 압출된 필라멘트가 세장화기에 진입하기 전에 압출된 필라멘트 내의 임의의 변화를 위한 매체일 수 있다. Alternatively, not the quench streams is not used, any change in the extruded filaments before that if the ambient air or other fluid between the extrusion head 10 and the elongated flame 16 is extruded filaments entering the elongated weapon It can be a medium for. 필라멘트(15)는 세장화기(16)를 통과하고, 이어서 수집기(19) 상으로 배출되며, 여기에서 섬유의 집합체(20)로서 수집된다. Filament 15 is passed through the elongated weapon (16) and then discharged onto the collector 19, it is collected here as an aggregate 20 of the fiber. 세장화기 내에서, 필라멘트는 길어지고 직경이 감소되며, 필라멘트 내의 중합체 분자들이 배향되고, 섬유 내의 중합체 분자들 중 적어도 일부는 섬유의 종축과 정렬된다. In the elongated flame, the filament is longer and is reduced in diameter, and the polymer molecules in the filaments are oriented, at least some of the polymer molecules within the fibers are aligned with the longitudinal axis of the fiber. 반결정질 중합체의 경우에, 이러한 배향은 대체로 변형 유도 결정성을 발현하기에 충분하고, 이는 생성된 섬유를 아주 강하게 한다. In the case of semi-crystalline polymer, this orientation is generally sufficient to develop the strain induced crystallinity, which is very strong and the resulting fiber. 수집기(19)는 일반적으로 다공성이고, 기체 취출 장치(114)가 수집기 아래에 위치되어 수집기 상으로의 섬유의 적층을 보조할 수 있다. Collector 19 is generally porous and a gas take-out unit 114 is positioned below the collector, it is possible to assist the deposition of fibers onto the collector. 세장화기 출구와 수집기 사이의 거리(21)는 상이한 효과를 얻기 위해 변할 수 있다. The distance 21 between the elongated fire exit and the collector may be varied to obtain different effects. 또한, 수집 이전에, 압출된 필라멘트 또는 섬유는 도 2에 도시되지 않은 다수의 추가적인 처리 단계, 예컨대 추가적인 인발, 분사 등을 받을 수 있다. Also, prior to collection, it is possible to receive the extruded filaments or fibers have a number of additional processing steps not illustrated in Figure 2, for example, an additional pull-out, injection and the like. 수집 후에, 수집된 집합체(20)는 더 상세하게 후술하는 바와 같이 일반적으로 가열 및 급랭되지만, 집합체는 필요하다면 이후의 가열 및 급랭을 위해 저장 롤로 권취될 수 있다. After collection, the collection assembly 20, but generally heated and quenched as described in more detail below, the aggregate can be wound and stored for later heating and quenching of the roll as needed. 일반적으로, 집합체(20)가 가열 및 급랭되면, 이는 캘린더(calender), 엠보싱 스테이션(embossing station), 라미네이터(laminator), 커터(cutter) 등과 같은 다른 장치로 이송될 수 있거나, 또는 구동 롤(22)을 통과하여 저장 롤(23)로 권취될 수 있다. In general, when the assembly 20 is heated and quenched, which calender (calender), the embossing station (embossing station), the laminator (laminator), may be transferred to another device such as a cutter (cutter), or the drive roll (22 ) it can be wound up at a storage roll 23 to pass through. 웨브를 형성하는 바람직한 방법에서, 섬유의 집합체(20)는 도 2 내지 도 4에 도시된 바와 같이 수집기(19)에 의해 운반되어 가열 및 급랭 작업을 거치게 된다. In a preferred method of forming a web, the assembly 20 of fibers is carried by the collector 19 as shown in FIGS. 2 to 4 is subjected to heating and quenching operation. 단순화 목적으로, 특히 도 3 및 도 4에 도시된 장치를 흔히 급랭식 유동 히터 또는 더 간단하게는 급랭식 히터로 부른다. The simplification purpose, particularly Figs. 3 and referred to the apparatus shown in Figure 4 as is often quenched flow heater type or more simply, quenched heater. 수집된 집합체(20)는 먼저 수집기(19) 위에 장착된 제어식 가열 장치(100) 아래로 통과된다. The collection assembly 20 is passed down the first collector 19. The controlled heating device 100 mounted above. 예시적인 가열 장치(100)는 상부 플리넘(102) 및 하부 플리넘(103)으로 분할된 하우징(101)을 포함한다. An exemplary heating device 100 comprises a housing 101 divided into an upper plenum 102 and lower plenum 103. 상부 및 하부 플리넘은 전형적으로 크기 및 간격이 균일한 일련의 구멍(105)이 천공된 플레이트(104)에 의해 분리된다. Is separated by a perforated plate 104 is a series of holes 105 typically have a uniform size and spacing beyond the upper and lower replicon. 기체, 전형적으로 공기가 도관(107)으로부터 개구(106)를 통해 상부 플리넘(102) 내로 공급되고, 플레이트(104)는 상부 플리넘 내로 공급된 공기가 플레이트를 통해 하부 플리넘(103) 내로 통과될 때 상당히 균일하게 분포되게 하는 유동 분배 수단으로서 기능한다. Gas, into the typically air is through the opening 106 from the conduit 107 is fed into the upper plenum 102, the plate 104 is in the air is lower plenum 103 through the plate fed into more than the upper plenum functions as a flow distribution means to be substantially uniformly distributed when passed through. 다른 유용한 유동 분배 수단은 핀(fin), 배플(baffle), 매니폴드, 에어 댐, 스크린 또는 소결 플레이트, 즉 공기의 분포를 균등하게 하는 장치를 포함한다. Other useful flow distribution means comprises a device which produces an equal fin (fin), a baffle (baffle), manifolds, air dams, screens or sintered plates, i.e., the distribution of air. 예시적인 가열 장치(100)에서, 하부 플리넘(103)의 바닥 벽(108)은 긴 직사각형 슬롯(109)을 갖도록 형성되고, 이를 통해 하부 플리넘으로부터의 가열된 공기의 커튼형 스트림(110)이 가열 장치(100) 아래에서 수집기(19) 상에서 이동하는 집합체(20) 상으로 송풍된다 (집합체(20) 및 수집기(19)는 도 3에서 부분적으로 절결되어 도시되어 있다). In the illustrative heating device 100 the bottom wall 108 of the lower plenum 103 it is formed to have a long rectangular slot 109, the curtain-shaped stream of heated air from the lower plenum through which 110 the heating device 100 is blown onto the assembly (20) moving on the collector 19 at the bottom (assembly 20 and the collector 19 is shown partially cut away in Fig. 3). 기체 취출 장치(114)는 바람직하게는 가열 장치(100)의 슬롯(109) 아래에 놓이기에 충분히 연장하고 (아울러, 후술할 바와 같이, 가열된 스트림(110)을 넘어 표시 영역(120)을 통해 거리(118)로 웨브 하류로 연장한다). A gas take-out apparatus 114 is preferably fully extended to being placed under the slot 109 of the heating device 100, and (as well, as described below, beyond the heated stream 110 through the display region 120, a distance 118 extends to the web downstream). 따라서, 플리넘 내의 가열된 공기는 플리넘(103) 내의 내부 압력 하에 있고, 슬롯(109)에서 이 공기는 또한 기체 취출 장치(114)의 배기 진공 하에 있다. Thus, the heated air in the plenum beyond is under the exhaust vacuum of the plenum air is also a gas take-out apparatus 114 in the inside is under pressure, the slot 109 in the unit 103. 배기력을 추가로 제어하기 위해, 천공 플레이트(111)가 수집기(19) 아래에 위치되어 가열된 공기의 스트림(110)을 수집된 집합체(20)의 폭 또는 가열 영역에 걸쳐 원하는 균일성으로 확산시키는 것에 기여하는 일종의 배압 또는 유동 제한 수단을 부여할 수 있고, 수집된 집합체의 가능한 저밀도 부분을 통한 스트리밍(streaming)을 억제할 수 있다. In order to further control by the ship energy, a perforated plate 111 is the collector 19 is positioned under the diffusion in a desired uniformity over the width or heated area of ​​the collected stream 110 of heated air aggregate (20) may give a kind of back pressure or flow restriction means that contributes to that, it is possible to suppress the streaming (streaming) over the low density portions of the collected aggregate. 다른 유용한 유동 제한 수단은 스크린 또는 소결 플레이트를 포함한다. Other useful flow restriction means comprises a screen or sintered plates. 플레이트(111) 내의 개구의 개수, 크기 및 밀도는 원하는 제어를 달성하기 위해 상이한 영역들 내에서 변할 수 있다. The number, size and density of openings in the plate 111 may vary in different areas to achieve desired control. 다량의 공기가 섬유 형성 장치를 통과하고, 섬유가 영역(115) 내에서 수집기에 도달할 때 폐기되어야 한다. A large amount of air passing through the fiber forming apparatus, must be disposed of when the fibers reach the collector in the region 115. 충분한 공기가 영역(116) 내에서 웨브 및 수집기를 통과하여 처리 공기의 다양한 스트림 하에서 웨브를 제 위치에 유지한다. With sufficient air passes through the web and collector in the region 116 to keep the web under the various streams of processing air in place. 처리 공기가 웨브를 통과할 수 있게 하도록 충분한 개방도가 열처리 영역(117)과 급랭 영역(118) 하에서 플레이트 내에서 필요하고, 공기가 더 균등하게 분포되는 것을 보장하도록 충분한 저항이 유지된다. Sufficient opening is to allow the process air to pass through the web required in the plate under the heat-treating region 117 and quenching region 118, and a sufficient resistance is maintained to ensure that the air is more evenly distributed. 집합체(20)를 통과하는 가열된 공기의 양 및 온도는 섬유의 형태의 적절한 변형으로 이어지도록 선택된다. The amount and temperature of heated air passing through the assembly 20 are selected such that after the appropriate transformation of the form of fibers. 특히, 양 및 온도는 섬유가 가열되어 a) 섬유의 단면 내의 상당한 분자 부분, 예컨대 섬유의 비정질 특징 상의 용융/연화를 일으키지만, b) 다른 주요한 상, 예컨대 미소결정 특징 상의 완전한 용융은 일으키지 않도록 선택된다. In particular, the amount and temperature of the fiber is heated a) a significant molecular portions within a cross-section of the fiber, for example, only to cause the melting / softening on the fiber amorphous characteristics, b) the complete melting on the other major phase, such as crystallite characteristics selected so as to cause do. 전형적으로 비정질 중합체 재료가 용융되기보다는 연화되고, 비정질 특징 상 내에 어느 정도 존재할 수 있는 결정질 재료가 전형적으로 용융되기 때문에, "용융/연화"라는 용어를 사용한다. Typically be softened rather than the amorphous polymer material melt, since the crystalline material in some extent be present in the amorphous phase is typically characterized by melting, use the term "melt / soften". 이는 또한 상과 관계없이, 단순히 섬유 내의 더 낮은 배열의 미소결정의 용융을 일으키기 위한 가열로서 기술될 수도 있다. This can also independently of the phase, may simply be described as a heat for generating a better melting of the crystallites of the lower array in the fiber. 섬유는 전체적으로 용융되지 않고 유지되고, 예컨대 섬유는 일반적으로 처리 전에 가졌던 것과 동일한 섬유 형상 및 치수를 유지한다. Fiber is maintained without melting as a whole, for example, fibers generally retain the same fiber shape and dimensions as that had before processing. 미소결정 특징 상의 상당 부분은 열처리 후에 기존의 결정 구조를 유지하는 것으로 이해된다. Large part on the crystallite characteristics are understood to retain their existing crystal structure after the heat treatment. 결정 구조는 기존의 결정 구조에 추가되었을 수 있거나, 고도로 배열된 섬유의 경우에 결정 구조는 제거되어 구별 가능한 비정질 특징 상과 미소결정 특징 상을 생성했을 수 있다. The crystal structure or may have been added to the existing crystal structure, the crystal structure is highly removed in the case of the fiber array may have created a distinguishable feature amorphous phase and a microcrystalline phase characteristics. 수집된 집합체(20) 전체에 걸쳐 의도된 섬유 형태 변화를 달성하기 위해, 온도-시간 조건은 집합체의 전체 가열 영역에 걸쳐 제어되어야 한다. To achieve the intended fiber morphology change throughout the collected aggregate 20, and temperature-time conditions must be controlled over the whole heated area of ​​the aggregate. 웨브를 통과하는 가열된 공기의 스트림(110)의 온도가 처리되는 집합체의 폭을 가로질러 5℃의 범위 이내, 바람직하게는 2℃ 또는 심지어 1℃ 이내일 때 가장 양호한 결과를 얻었다 (가열된 공기의 온도는 흔히 작업의 간편한 제어를 위해 가열된 공기의 하우징(101) 내로의 진입 지점에서 측정되지만, 열전쌍에 의해 수집된 웨브에 인접하여 측정될 수도 있다). The temperature of the stream 110 of heated air passing through the web across the width of the assembly that is processed within the range of 5 ℃, preferably 2 ℃ or when even within 1 ℃ obtain the most favorable results (the heated air but the temperature is often measured at the point of entry into the housing of the heated air 101, for easy control of the work, and may be measured adjacent the collected web by a thermocouple). 또한, 가열 장치는 예컨대 과다 가열 또는 과소 가열을 회피하기 위해 히터를 신속하게 켜고 끔으로써, 시간에 따른 스트림 내의 정상 온도를 유지하도록 작동된다. The heating apparatus is, for example as a quick turn off the heater in order to avoid over-heating or under heating, and is operable to maintain a steady temperature in the stream over time. 가열을 추가로 제어하고 수집된 집합체(20)의 섬유의 원하는 형태의 형성을 완성하기 위해, 집합체는 가열된 공기의 스트림(110)이 가해진 직후에 급랭된다. To complete the fiber formation of the desired form of the aggregates 20 is controlled to collect an additional heating, the assembly is rapidly cooled immediately after the applied stream 110 of heated air. 그러한 급랭은 대체로 집합체가 제어된 고온 공기 스트림(110)을 벗어날 때 집합체(20) 위에서 이를 통해 주위 공기를 흡인함으로써 얻어질 수 있다. By sucking the ambient air through this, on the assembly 20 when such a rapid cooling is usually leaves the hot air stream 110. The aggregate is controlled can be obtained. 도 4의 숫자 120은 주위 공기가 웨브를 통해 기체 취출 장치에 의해 흡입되는 영역을 나타낸다. The number 120 of FIG. 4 is a region to which ambient air is drawn in by the gas take-out apparatus through the web. 기체 취출 장치(114)는 가열 장치(100)를 넘어 거리(118)만큼 수집기를 따라 연장하여, 영역(120) 내에서의 전체 집합체(20)의 완전한 냉각 및 급랭을 보장한다. A gas take-out apparatus 114 ensures complete cooling and quenching of the entire assembly 20 in the extended along the collector as beyond the heating device 100, the distance 118, the region 120. 공기가 예컨대 도면의 도 4에서 표시된 영역(120a) 내에서 하우징(101)의 기부 아래로 흡입될 수 있어서, 공기는 웨브가 고온 공기 스트림(110)을 벗어난 직후에 웨브에 도달한다. In the example, the drawing of air can be sucked down to the base of the housing 101 in the region (120a) shown in Figure 4, the air reaches the web immediately after the web is out of the hot air stream (110). 원하는 급랭 결과는 웨브 및 섬유로부터 열을 신속하게 제거하여, 섬유 내에서 이후에 발생할 결정화 또는 분자 배열의 정도 및 성질을 제한하는 것이다. Desired quench result is to limit the extent and nature of crystallization or molecular arrangement occurs after the inside to rapidly remove heat from the web and the fibers, fiber. 일반적으로, 개시된 가열 및 급랭 작업은 웨브가 컨베이어 상에서의 작업을 통해 이동될 때 수행되고, 급랭은 웨브가 작업의 종료 시에 저장 롤로 권취되기 전에 수행된다. In general, the heating and rapid cooling operation described is carried out when the web is moved through the operation on a conveyor, quenching is performed before the web is stored at the end of the work roll to the take-up. 처리 시간은 웨브가 작업을 통해 이동되는 속도에 의존하지만, 일반적으로 총 가열 및 급랭 작업은 1분 이하, 바람직하게는 15초 미만으로 수행된다. Treatment time depends on the speed at which the web is moved through the operation, but is generally carried out in a total heating and quenching operation is less than one minute, preferably less than 15 seconds. 용융/연화된 상태로부터 고화된 상태로의 신속한 급랭에 의해, 비정질 특징 상은 섬유의 연화, 또는 반복 가능한 연화를 방해할 수 있는 분자 물질이 감소된 채로, 더 정제된 결정질 형태로 동결되는 것으로 이해된다. By rapid quenching in a solidified state from the molten / softened state, while the softening, or repeating molecular material that can interfere with the possible softening of the amorphous characteristic phase fiber decreases, it is understood to be frozen into more purified crystalline form . 바람직하게는, 집합체는 공칭 융점보다 적어도 50℃ 낮은 온도에서 기체에 의해 냉각되고, 또한 급랭 기체 또는 다른 유체는 바람직하게는 적어도 1초 정도의 시간 동안, 바람직하게는 가열된 스트림이 웨브와 닿는 시간의 적어도 2배 또는 3배의 시간 동안 가해진다. Preferably, the aggregate is at least cooled by a gas at 50 ℃ low temperature, and quenching gas or other fluid is preferably for a time of at least one second time is preferably heated stream contact with the web than the nominal melting point a is at least applied for two or three times the time. 여하튼, 급랭 기체 또는 다른 유체는 섬유를 신속하게 고화시키기에 충분한 열 용량을 갖는다. At any rate, the quench gas or other fluid has sufficient heat capacity to rapidly solidify the fibers. 사용될 수 있는 다른 유체는 섬유 상으로 분사되는 물, 예컨대 섬유를 가열하기 위한 가열된 물 또는 증기, 및 섬유를 급랭시키기 위한 상대적으로 차가운 물을 포함한다. Other fluids that may be used include the relatively cold water for quenching the water sprayed onto the fibers, e.g., heated water or steam to heat the fibers, and fibers. 비정질 특징 상의 원하는 열처리 및 형태를 달성하는데 있어서의 성공은 흔히 처리된 웨브로부터의 대표적인 섬유의 DSC 시험으로 확인될 수 있고, 처리 조건은 전술한 미국 특허 출원 제11/461,201호에 더 상세하게 설명되어 있는 바와 같이 DSC 시험으로부터 습득된 정보에 따라 조정될 수 있다. Success in achieving the desired heat treatment, and form on the amorphous characteristics can be confirmed by DSC testing of representative fibers from a common processing webs, the processing conditions are described in more detail in the aforementioned U.S. Patent Application No. 11/461 201 No. as it can be adjusted according to information learned from the DSC testing. 바람직하게는, 가열된 공기를 가하고 급랭시키는 것은 적절한 주름진 매트릭스의 형성을 용이하게 하는 특성을 갖는 웨브를 제공하도록 제어된다. Preferably, it is added to quench the heated air is controlled to provide a web having the properties of facilitating the formation of a suitable pleated matrix. 불충분한 가열이 이용되면, 웨브는 주름잡기가 어려울 수 있다. If insufficient heat is used, the web may be difficult to catch wrinkles. 과다한 가열 또는 불충분한 급랭이 이용되면, 웨브는 용융되거나 취성화될 수 있고, 또한 충분한 대전을 취할 수 없다. If excessive heating or insufficient quenching is used, the web may be melted or activated alcohol, also can not take adequate charge. 개시된 부직 웨브는 랜덤한 섬유 배열 및 대체로 등방성인 평면내 물리적 특성(예컨대, 인장 강도)를 가질 수 있거나, 필요하다면 정렬된 섬유 구성(예컨대, 섬유들이 전술한 샤 등의 미국 특허 제6,858,297호에 설명된 바와 같이 기계 방향으로 정렬되어 있는 구성) 및 이방성 평면내 물리적 특성을 가질 수 있다. The disclosed nonwoven webs are described in U.S. Patent No. 6,858,297 issue of such a my physical properties random fiber arrangement and generally isotropic in a plane or may have a (e. G., Tensile strength), consisting of a sort if necessary, fibers (e.g., fibers above Shah the may have been aligned in the machine direction physical characteristics durability) and anisotropy in the plane as described. 다양한 중합체 섬유 형성 재료가 개시된 공정에서 사용될 수 있다. A variety of polymeric fiber-forming material can be used in the disclosed process. 중합체는 본질적으로 부직 웨브를 제공할 수 있는 임의의 열가소성 섬유 형성 재료일 수 있다. The polymer may be any thermoplastic fiber-forming material capable of providing a nonwoven web in nature. 대전될 웨브의 경우, 중합체는 본질적으로 만족스러운 일렉트릿 특성 또는 전하 분리를 유지하는 임의의 열가소성 섬유 형성 재료일 수 있다. For a web to be charged, the polymer may be any thermoplastic fiber-forming material to maintain an essentially satisfactory electret properties or charge separation in. 대전 가능한 웨브에 대해 바람직한 중합체 섬유 형성 재료는 실온(22℃)에서 10 14 ohm-㎝ 이상의 체적 저항을 갖는 비전도성 수지이다. A preferred antistatic polymer formed on the fiber as possible web material is a non-conductive resin having a volume resistivity at least 10 14 ohm-㎝ at room temperature (22 ℃). 바람직하게는, 체적 저항은 약 10 16 ohm-㎝ 이상이다. Preferably, the volume resistivity is about 10 16 ohm-㎝ above. 중합체 섬유 형성 재료의 저항은 표준화된 시험 ASTM D 257-93에 따라 측정될 수 있다. Resistance of the polymeric fiber-forming material can be measured according to standardized test ASTM D 257-93. 대전 가능한 웨브에 사용하기 위한 중합체 섬유 형성 재료는 또한 바람직하게는 전기 전도성을 현저하게 증가시키거나 또는 달리 정전기 전하를 수용하여 유지하는 섬유의 능력을 방해할 수 있는 정전기 방지제와 같은 성분이 실질적으로 없다. Polymeric fiber-forming materials for use in chargeable webs also preferably are substantially free of components such as antistatic agents that may interfere with the ability of the fibers to maintain as to significantly increase or otherwise receiving an electrostatic charge to the electrically conductive . 대전 가능한 웨브에 사용될 수 있는 중합체의 몇몇 예는 폴리올레핀, 예컨대 폴리에틸렌, 폴리프로필렌, 폴리부틸렌, 폴리(4-메틸-1-펜텐) 및 사이클릭 올레핀 공중합체, 및 그러한 중합체들의 조합을 함유하는 열가소성 중합체를 포함한다. Some examples of polymers that may be used in chargeable webs are polyolefins such as polyethylene, polypropylene, polybutylene, poly (4-methyl-1-pentene) and cyclic olefin copolymers, and thermoplastic polymers containing a combination of such It comprises a polymer. 사용될 수 있지만 대전이 어려울 수 있거나 전하를 빠르게 상실할 수 있는 다른 중합체는 폴리카르보네이트, 블록 공중합체, 예컨대 스티렌-부타디엔-스티렌 및 스티렌-아이소프렌-스티렌 블록 공중합체, 폴리에스테르, 예컨대 폴리에틸렌 테레프탈레이트, 폴리아미드, 폴리우레탄, 및 본 기술 분야의 숙련자에게 친숙한 다른 중합체를 포함한다. It can be used, but other polymers which the charging can be difficult, or to quickly lose their charge are polycarbonates, block copolymers such as styrene-butadiene-styrene and styrene-isoprene-styrene block copolymer, a polyester such as polyethylene terephthalate phthalate, and a polyamide, polyurethane, and those skilled in the art including other polymers familiar. 섬유는 바람직하게는 폴리-4-메틸-1 펜텐 또는 폴리프로필렌으로부터 제조된다. Fibers preferably are prepared from poly-4-methyl-1-pentene or polypropylene. 가장 바람직하게는, 섬유는 특히 수분 환경에서 전하를 보유하는 능력 때문에 폴리프로필렌 단일중합체로부터 제조된다. Most preferably, the fibers are in particular made from polypropylene homopolymer because of its ability to hold the charge in the water environment. 전하는 다양한 방식으로 개시된 부직 웨브에 부여될 수 있다. Charge can be imparted to the disclosed nonwoven webs in a variety of ways. 이는 예를 들어 안가드지반드(Angadjivand) 등의 미국 특허 제5,496,507호에 개시된 바와 같이 웨브를 물과 접촉시킴으로써, 클라세(Klasse) 등의 미국 특허 제4,588,537호에 개시된 바와 같이 코로나 처리함으로써, 예를 들어 루쏘(Rousseau) 등의 미국 특허 제5,908,598호에 개시된 바와 같이 하이드로차징(hydrocharging)함으로써, 존스(Jones) 등의 미국 특허 제6,562,112 B2호 및 데이비드(David) 등의 미국 특허 출원 공개 제2003/0134515 A1호에 개시된 바와 같이 플라즈마 처리함으로써, 및 이들의 조합에 의해 수행될 수 있다. This is for, by a not a guard ground de (Angadjivand) webs as disclosed in U.S. Patent No. 5,496,507 issue of such example in contact with water, by a corona treatment as disclosed in U.S. Patent No. 4,588,537 arc such Classe (Klasse), e. g. Rousseau (Rousseau), such as the United States by hydro-charging (hydrocharging) as disclosed in Patent No. 5,908,598, Jones (Jones) U.S. Patent Application Publication, such as U.S. Patent No. 6,562,112 B2 and David (David), such as the 2003/0134515 by plasma treatment as described in A1, and may be performed by a combination of the two. 첨가제가 중합체에 첨가되어, 웨브의 여과 성능, 일렉트릿 대전 용량, 기계적 특성, 시효 특성, 착색, 표면 특성 또는 다른 관심 특징을 향상시킬 수 있다. Additives may be added to the polymer, improving the filtration performance of webs, the electret charging capacity, mechanical properties, aging properties, coloration, surface properties or other characteristics of interest. 대표적인 첨가제는 충전제, 핵화제(예컨대, 밀리켄 케미칼(Milliken Chemical)로부터 구매 가능한 밀라드(MILLAD)™ 3988 다이벤질리덴 소르비톨), 일렉트릿 대전 촉진 첨가제(예컨대, 트라이스테아릴 멜라민, 및 시바 스페셜티 케미칼즈(Ciba Specialty Chemicals)의 키마소브(CHIMASSORB)™ 119 및 키마소브 944와 같은 다양한 광 안정화제), 경화 개시제, 강화제(예컨대, 폴리(4-메틸-1-펜텐)), 표면 활성화제 및 표면 처리제(예컨대, 존스 등의 미국 특허 제6,398,847 B1호, 제6,397,458 B1호, 및 제6,409,806 B1호에 설명된 바와 같은 유상 미스트 환경에서 여과 성능을 개선하기 위한 불소 원자 처리제)를 포함한다. Representative additives include fillers, nucleating agent (e.g., Milliken Chemical (commercially available Millard (MILLAD) ™ 3988 is dibenzylideneacetone sorbitol from Milliken Chemical)), electret charging promoting additive (e. G., Tri-stearyl melamine, and Ciba Specialty Chemical's (Ciba Specialty Chemicals) key Massonnat probe various light stabilizers such as (CHIMASSORB) ™ 119 and key Massonnat bracket 944), a curing initiator, reinforcing agents (e.g., poly (4-methyl-1-pentene) of) surface-activated It includes a first and a surface treatment agent (for example, Jones et al, US Patent No. 6,398,847 B1, 1 - 6,397,458 B1 arc, and the 6409806 fluorine treatment to improve filtration performance in an oily mist environment as described in the B1 number). 그러한 첨가제의 유형 및 양은 본 기술 분야의 숙련자에게 친숙할 것이다. Type and amount of such additives will be familiar to those skilled in the art. 예를 들어, 일렉트릿 대전 촉진 첨가제는 일반적으로 약 5 중량% 미만, 더 전형적으로 약 2 중량% 미만의 양으로 존재한다. For example, electret charging promoting additive is generally less than about 5% by weight, and more typically present in an amount less than about 2% by weight. 개시된 부직 웨브는 전술한 구보까와 등의 미국 특허 제6,740,137 B2호 및 전술한 썬뎃 등의 '226 출원에 설명된 것과 같은 방법 및 구성요소를 사용하여 주름 필터로 형성될 수 있다. The disclosed nonwoven webs using the same method and components as those described in the '226 application as a United States patent, such as the aforementioned double-time how the above-mentioned and No. 6,740,137 B2 sseondet etc. may be formed of a pleated filter. 주름 형성은 일반적으로 섬유 교차점들 중 적어도 일부에서 섬유들을 서로 결합 (또는 추가로 결합)시키기 위해 열의 사용에 의해 보조될 수 있다. Wrinkle formation may be assisted by the use of heat to generally (in combination or addition) to the fibers bonded to each other the fibers in at least some of the intersection points. 주름 형성은 본 기술 분야의 숙련자에게 친숙할 다른 방법 및 구성요소를 사용하여 수행되거나 증진될 수 있다. Crimping can be carried out or enhancement using different methods and components familiar to those skilled in the art. 자립식 필터 요소를 제공하도록 요구되지는 않지만, 개시된 주름 필터는 필요하다면 개시된 단층 매트릭스 이외의 하나 이상의 추가 요소 또는 층을 포함할 수 있다. Although it is not required to provide a self-standing type filter element, the disclosed pleated filters may include one or more additional elements or layers other than the disclosed monolayer matrix if necessary. 예를 들어, 필터 요소의 선택된 부분이 선단 안정부(예컨대, 평면의 와이어 면 층 또는 고온 용융 접착제의 선) 또는 주연 보강부(예컨대, 모서리 접착제 또는 필터 프레임)을 추가함으로써 안정화 또는 보강될 수 있다. For example, a selected portion of the filter element can be stabilized or reinforced by the addition of the tip stabilizer (e.g., a wire surface layer or a high temperature line of hot-melt adhesive of the plane) or a peripheral reinforcement (e. G., Edge adhesive or a filter frame) . 하나 이상의 추가 층(예컨대, 흡수 입자를 함유하는 다공성 층)이 필터 요소 내에 포함되어 관심 증기를 포획할 수 있다. (Porous layer containing, for example, absorbent particles) of one or more further layers are contained within the filter element can take the vapor of interest. 주름 형성 이전에, 평량, 웨브 두께, 고형도, EFD, 걸리 강성, 테이버(Taber) 강성, % DOP 투과율, 초기 % NaCl 투과율, 압력 강하 또는 품질 계수(QF)와 같은 편평 웨브 특성을 모니터링하는 것이 바람직할 수 있다. Prior to crimping, basis weight, web thickness, the solid also, EFD, Gurley Stiffness, Taber (Taber) rigidity,% DOP transmittance, initial% NaCl permeability, to monitor flat web properties such as pressure drop or a quality factor (QF) it may be desirable. 주름 형성 이후에, 평균 초기 서브마이크로미터 효율 또는 압력 강하와 같은 주름진 웨브 특성을 모니터링하는 것이 도움이 될 수 있다. After crimping, it may be helpful to monitor the corrugated web properties such as the average initial sub-micrometer efficiency or pressure drop. EFD는 (달리 규정되지 않으면) 문헌[Davies, CN, "The Separation of Airborne Dust and Particles", Institution of Mechanical Engineers, London, Proceedings 1B, 1952]에 설명되어 있는 방법을 사용하여, (13.8 ㎝/s의 면 속도에 대응하는) 85 L/min의 공기 유량을 사용하여 결정될 수 있다. EFD is described using the method described in [Davies, CN, "The Separation of Airborne Dust and Particles", Institution of Mechanical Engineers, London, Proceedings 1B, 1952], (13.8 ㎝ / s (unless otherwise specified) corresponding to the surface speed) can be determined using an air flow rate of 85 L / min. 걸리 강성은 걸리 프리시전 인스트루먼츠(Gurley Precision Instruments)의 모델 4171E 걸리(GURLEY)™ 굽힘 저항 시험기를 사용하여 측정될 수 있다. Gurley Stiffness Gurley can be measured using a Gurley Model 4171E (GURLEY) ™ bending resistance tester of Precision Instruments (Gurley Precision Instruments). 샘플의 긴 변이 웨브 횡(웨브 횡단) 방향으로 정렬된 상태로 3.8 ㎝ × 5.1 ㎝의 직사각형이 웨브로부터 다이 커팅된다. A long side lateral webs (web crossing) the alignment direction of the sample is a 3.8 × 5.1 ㎝ ㎝ rectangles are die cut from the web. 샘플은 샘플의 긴 변이 웨브 유지 클램프 내에 있는 상태로 굽힘 저항 시험기 내로 로딩된다. The sample is loaded into the Bending Resistance Tester with the state in the long side webs holding the clamp of the sample. 샘플은 양 방향으로, 즉 시험 아암이 제1 주 샘플 면에 대해 그리고 이어서 제2 주 샘플 면에 대해 가압되면서 휘어지고, 두 측정치의 평균은 밀리그램 단위의 강성으로서 기록된다. Samples in both directions, that is being bent while the test arm pressed against the sample and then the second main surface to the first major sample face, and the average of the two measurements is recorded as the stiffness in milligrams unit. 시험은 파괴 시험으로서 처리되고, 추가의 측정이 필요하다면 새로운 샘플을 이용한다. The test is treated as a destructive test, use a new sample and need additional measurement. 테이버 강성은 (테이버 인더스트리즈(Taber Industries)로부터 구매 가능한) 모델 150-B 테이버™ 강성 시험기를 사용하여 측정될 수 있다. Taber Stiffness may be determined using a (Taber Industries commercially available from (Taber Industries)) Model 150-B stiffness tester Taber ™. 3.8 ㎝ × 3.8 ㎝의 정사각형 섹션이 섬유 융합을 방지하도록 예리한 면도날을 사용하여 웨브로부터 주의깊게 절단되고, 3 내지 4개의 샘플 및 15°샘플 편향(deflection)을 사용하여 기계 방향 및 횡단 방향으로의 그의 강성을 측정하기 위해 평가된다. The square section of 3.8 ㎝ × 3.8 ㎝ been carefully cut from the webs using a sharp razor blade to prevent fiber fusion, of from 3 to 4 samples and a 15 ° sample using the deflection (deflection) machine direction and cross direction of his It is evaluated to measure the stiffness. 이 QF를 계산하기 위해 사용될 수 있다. It can be used to calculate a QF. 선택된 챌린지 에어로졸에 대해 측정 또는 계산될 수 있는 파라미터는 초기 입자 투과율, 초기 압력 강하, 초기 품질 계수(QF), 최대 입자 투과율, 최대 투과율에서의 압력 강하, 및 최대 투과율에서 로딩된 입자의 밀리그램(최대 투과율 시점까지의 필터에 대한 총 중량 챌린지)를 포함한다. Parameters that can be measured or calculated for the chosen challenge aerosol is the initial particle permeability, initial pressure drop, initial Quality Factor (QF), a maximum particle permeability, pressure drop in the maximum transmittance, and the milligrams of particle loading at maximum transmittance (max. and a total weight challenge to the filter up to the time of transmission). 초기 품질 계수(QF) 값은 보통 전체 성능의 신뢰할 수 있는 지표를 제공하고, 여기서 더 높은 초기 QF 값은 더 양호한 여과 성능을 나타내고 더 낮은 초기 QF 값은 감소된 여과 성능을 나타낸다. The initial quality factor (QF) value provides a reliable indicator of overall performance, usually, where higher initial QF value indicates better filtration performance, lower initial QF value indicates a decreased filtration performance. 이 각각의 채널에 대한 포획 효율을 산정하기 위해 사용될 수 있다. It may be used to calculate the capture efficiency for each channel. 4개의 서브마이크로미터 채널(즉, 입자 직경이 0.3 내지 0.4 ㎛, 0.4 내지 0.55 ㎛, 0.55 내지 0.7 ㎛ 및 0.7 내지 1.0 ㎛임)의 각각에 대한 포획 효율 값은 평균되어 "평균 초기 서브마이크로미터 효율"에 대한 하나의 값을 얻을 수 있다. Four sub-micrometer channel (i.e., a particle diameter of 0.3 to 0.4 ㎛, 0.4 to 0.55 ㎛, 0.55 to 0.7 ㎛ and 0.7 to 1.0 ㎛ Im) capture efficiency value for each is the average "mean initial submicrometer efficiency it is possible to obtain a value for. " 시험 속도, 효율 및 압력 강하 결과치가 보통 모두 보고된다. The test speed, efficiency and pressure drop results are usually reported both. 본 발명은 다음의 예시적인 실시예에서 추가로 설명되는데, 여기서 모든 부 및 백분율은 달리 표시되지 않으면 중량에 의한 것이다. Present invention there is further described in the following illustrative examples, wherein all parts and percentages are by weight unless otherwise indicated. 도 2 내지 도 4에 도시된 것과 같은 장치를 사용하여, 1성분 단층 웨브를 토탈 페트로케미칼즈(Total Petrochemicals)로부터 입수 가능한 37의 용융 유량 지수를 갖는 피나(FINA)™ 3868 폴리프로필렌으로부터 형성하였다. Even using an apparatus such as that illustrated in Figures 2 to 4, it was formed from the pina (FINA) ™ 3868 polypropylene having a melt flow index, available 37 from a one-component single layer webs total Petro-Chemical's (Total Petrochemicals). 압출 헤드(10)는 하나의 열에 32개의 오리피스를 갖는 16개 열의 오리피스를 가져서 총 512개의 오리피스를 이루었다. Extrusion head 10 is one column gajyeoseo the column orifice 16 having an orifice 32 achieved a total of 512 orifices. 오리피스들을 6.4 ㎜ (0.25 인치) 간격으로 정사각형 패턴으로 배열하였다 (이는 오리피스들이 횡방향 및 종방향으로 정렬되었고, 횡방향 및 종방향으로 모두 동일하게 이격되었다는 것을 의미한다). Orifices were arranged in a square pattern with 6.4 ㎜ (0.25 inch) intervals (which means that the orifices have been arranged in the lateral direction and longitudinal direction, equally spaced in both transverse and longitudinal). 중합체를 구멍당 0.6 g/min으로 압출 헤드에 공급하였고, 여기서 중합체를 250℃ (482℉)의 온도로 가열하였다. The polymer was fed to the extrusion head in an 0.6 g / min per hole, in which the polymer is heated to a temperature of 250 ℃ (482 ℉). 2개의 급랭 공기 스트림(도 2의 18b; 스트림(18a)은 이용하지 않음)을 1.5 m/min (5 ft/min)의 대략적인 면 속도 및 7.2℃(45℉)의 온도로 높이가 305 ㎜ (12 인치)인 급랭 박스로부터의 상부 스트림으로서, 그리고 1.5 m/min (5 ft/min)의 대략적인 면 속도 및 주위 실온으로 높이가 305 ㎜ (12 인치)인 급랭 박스로부터의 하부 스트림으로서 공급하였다. Two quenching air streams (Fig. 2 of 18b; stream (18a) is not used), a height in the approximate surface temperature of the speed and 7.2 ℃ (45 ℉) of 1.5 m / min (5 ft / min) 305 ㎜ (12 in.) in an upper stream from quench boxes, and 1.5 m / min (5 ft / min) supplied as a bottom stream from the quench box approximate face velocity and the height is 305 ㎜ (12 inches) to around room temperature It was. 0.76 ㎜ (0.030 인치)의 에어 나이프 갭(30; 베리건 등), 0.09 ㎫ (13 psig)의 압력으로 에어 나이프로 공급되는 공기, 5.3 ㎜ (0.21 인치)의 세장화기 상부 갭 폭, 4.6 ㎜ (0.18 인치)의 세장화기 바닥 갭 폭, 및 152 ㎜(6 인치) 길이의 세장화기 측면(36; 베리건 등)을 이용하는 미국 특허 제6,607,624 B2호(베리건 등)에 도시된 것과 같은 가동 벽 세장화기를 이용하였다. 0.76 ㎜ (0.030 in.) The air knife gap (30; Berry gun,), 0.09 ㎫ (13 psig) air, 5.3 ㎜ (0.21 inches) to be supplied to the air knife at a pressure of elongated weapon upper gap width, 4.6 ㎜ ( 0.18 inch) elongation fire bottom gap width, and 152 ㎜ (6 inch) length of the elongated weapon side 36 (the movable wall of elongation as illustrated in berry gun, etc.) using the United States Patent No. 6,607,624 B2 No. (berry gun, etc.) It was used for the fire. 압출 헤드(10)로부터 세장화기(16)까지의 거리(17; 도 2)는 91 ㎝ (36 인치)였고, 세장화기(16)로부터 수집 벨트(19)까지의 거리(21; 도 2)는 58 ㎝ (23 인치)였다. (; Fig 17), the distance to 91 ㎝ (36 inches) respectively, and collecting belt 19 from the elongated weapon (16) distance to the elongated weapon 16 from the extrusion head 10, 21 (Fig. 2) was 58 ㎝ (23 inches). 멜트스펀 섬유 스트림을 약 64 ㎝ (약 25 인치)의 폭으로 수집 벨트(19) 상에 놓았다. The melt spun fiber was placed on a stream of about 64 ㎝ collecting belt 19 in the width of (about 25 inches). 수집 벨트(19)는 20 메시 스테인리스 강으로 제조하였고, 5.8 m/min (19 ft/min)의 속도로 이동시켰다. Collection belt 19 was made of a 20 mesh stainless steel and moved at a speed of 5.8 m / min (19 ft / min). 수집 벨트(19) 아래의 진공은 약 250-750 ㎩ (1-3 인치 H 2 O)의 범위 내에 있는 것으로 추정되었다. Collected under vacuum belt 19 was estimated to be in the range of about 250-750 ㎩ (1-3 inchi H 2 O). 플레이트(111)의 영역(115)은 23% 개방 면적으로 이어지는, 엇갈리게 이격된 1.6 ㎜ (0.062 인치) 직경의 개구들을 가졌고, 웨브 유지 영역(116)은 30% 개방 면적으로 이어지는, 엇갈리게 이격된 1.6 ㎜ (0.062 인치) 직경의 개구들을 가졌고, 가열/결합 영역(117) 및 급랭 영역(118)은 63% 개방 면적으로 이어지는, 엇갈리게 이격된 4.0 ㎜ (0.156 인치) 직경의 개구를 가졌다. Region 115 is 23% open area to follow, the offset had the spaced 1.6 ㎜ (0.062 inch) opening having a diameter, the web holding region 116 leading to a 30% open area, staggered spaced 1.6 of the plate 111 ㎜ (0.062 inch) had openings with a diameter of, the heating / bonding region 117 and the quenching region 118 leading to the 63% open area, and had a staggered spaced 4.0 ㎜ opening of (0.156 inches) in diameter. 공기를 1.9 ㎝ × 66 ㎝ (0.75 인치 × 26 인치)인 슬롯(109)에서 약 14.2 ㎥/min (500 ft 3 /min)의 공기를 제공하기에 충분한 속도로 도관(107)을 통해 공급하였다. It was fed through conduit 107 at a rate sufficient to provide air in the air 1.9 ㎝ × 66 ㎝ (0.75 inchi × 26 in.) Of the slot (109) to about 14.2 ㎥ / min (500 ft 3 / min) at. 플레이트(108)의 바닥은 수집기(19) 상의 수집된 웨브(20)로부터 약 1.5 ㎝ (0.6 인치)였다. The bottom of the plate 108 was about 1.5 ㎝ (0.6 inches) from the collected web 20 on collector 19. 급랭식 유동 히터의 슬롯(109)을 통과하는 공기의 온도는 하우징(101) 내로의 가열된 공기의 진입 지점에서 측정할 때 160℃(320℉)였다. The temperature of the air passing through the slot 109 of the quenched flow heater was 160 ℃ formula (320 ℉), as measured at the point of entry of the heated air into the housing 101. 급랭 영역(118)을 벗어나는 웨브는 자립식이며 통상의 공정 및 장비를 사용하여 취급할 수 있기에 충분한 완전성(integrity)을 갖도록 결합되고, 웨브는 저장 롤로의 통상의 권취에 의해 권취될 수 있거나 또는 주름 형성 및 주름 필터 패널과 같은 여과 장치로의 조립과 같은 다양한 작업을 거칠 수 있다. The web out of the quenching region 118 is coupled to have because it can be treated using conventional processes and equipment self an expression sufficient integrity (integrity), the web may be wound by conventional winding of a storage roll, or blank- various operations such as the assembling of the filtering device, such as a pleated filter, and the panel may be subjected. 웨브를 코로나 대전시키고, 아래의 표 1A에 도시된 여러 물리적 특성을 측정하기 위해 평가하였다. And corona charged webs were evaluated to measure the various physical properties shown in Table 1A below. % DOP 투과율 및 압력 강하 측정에 대해 보고된 13.8 ㎝/s의 면 속도는 8.28 m/min 면 속도에 대응하고, 이용된 샘플 크기에 대한 85 L/min 유량에 대응한다. Surface speed of the transmission and the% DOP 13.8 ㎝ / s report on the measured pressure drop correspond to 8.28 m / min for speed, and corresponds to 85 L / min flow rate for the sample size used. 대전된 편평 웨브를 주름을 안정화하기 위한 가열식 플래튼을 구비한 칼 라보프스키 아메리카 코포레이션(Karl Rabofsky America Corp.)의 라보프스키™ 주름 형성기(pleater)를 사용하여 주름 형성하였다. By using the charged flat webs knife LaBeouf ski America Corporation having a heated platen for stabilizing the folds LaBeouf skis (Karl Rabofsky America Corp.) ™ wrinkled former (pleater) to form wrinkles. 실시예 1의 주름 필터는 필터의 양 측면 상의 주름 선단에 확장된 와이어 스크린을 접착함으로써 형성하였다. Pleated filter of Example 1 was formed by bonding a wire screen to expand the distal end folds on both sides of the filter. 필터를 필터 요소의 양 측면 상의 필터 주연부 위에서 접힌 28 ㎜ (1.1 인치) 플랩(flap)을 갖는 2-부분 판지 프레임으로 프레임화하였다. A filter screen frame was a two-part frame having a collapsed carton 28 ㎜ (1.1 inches) the flap (flap) on the filter peripheral portion on both sides of the filter element. 필터 치수는 50 × 57.7 × 2 ㎝ (19.7 × 22.7 × 0.8 인치)였고, ㎝당 1.38개의 주름 (인치당 3.5개의 주름)이 있고 주름 높이는 2.06 ㎝ (0.8125 인치)이었다. Filter size was 50 × 57.7 × 2 ㎝ (19.7 × 22.7 × 0.8 inches) respectively, and 1.38 crimps per ㎝ (3.5 crimps per inch) and a height of 2.06 folds ㎝ (0.8125 inches). 필터를 최소 효율 보고값(MERV)을 결정하기 위해 애쉬래 표준 52.2를 사용하여 평가하였다. Ash was evaluated by using the standard 52.2 below to determine the minimum efficiency reporting value (MERV) filters. 아래의 표 1B에, (킴벌리 클라크 코포레이션으로부터 구매 가능하며 공급시 코로나 처리되어 있는) 33.9 gsm (2.1 oz/yd 2 ) 어큐에어™ 매체로부터 형성된 유사하게 주름진 필터를 사용하여 얻어진 결과와 함께 평가 결과를 설명하고 있다. 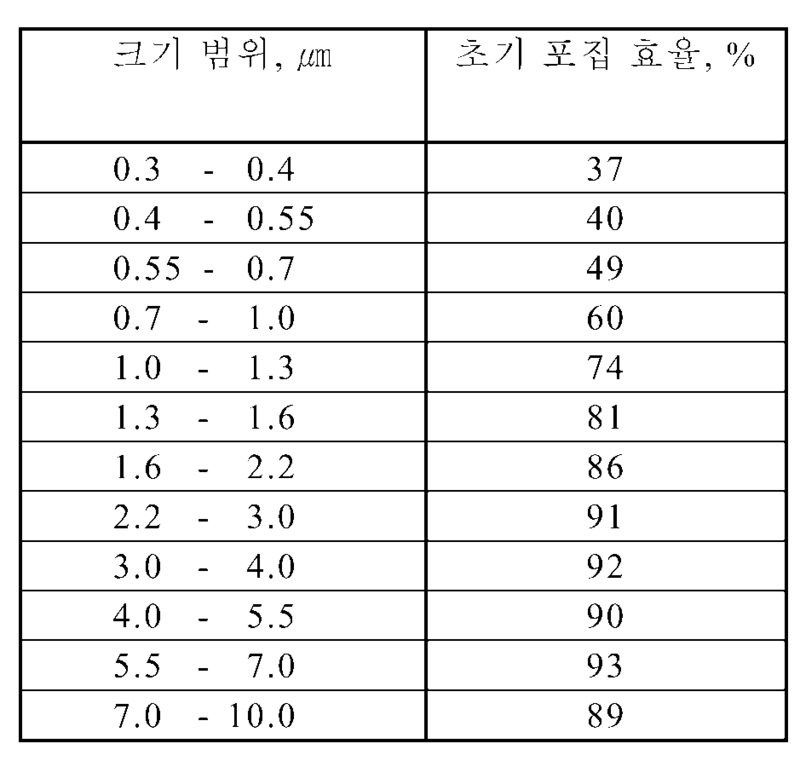 Are shown in Table 1B below (available from Kimberly-Clark Corporation and that is corona treated for supply) 33.9 gsm (2.1 oz / yd 2) by using the pleated filter similarly formed from eokyu air ™ media, the results of the evaluation with the results obtained It has been described. 평가는 1.52 m/s (300 ft/min)의 속도에서 0.25 ㎪ (1.0 인치 H 2 O)의 최종 압력 강하까지 수행하였다. The evaluation is carried out at a rate of 1.52 m / s (300 ft / min) to a final pressure drop of 0.25 ㎪ (1.0 inchi H 2 O). 표 1B의 데이터는 실시예 1의 필터가 어큐에어 매체로부터 제조된 필터보다 0.25 ㎪ (1.0 인치 H 2 O) 압력 강하에서 더 양호한 효율 및 더 양호한 포집 성능(holding capacity)을 제공했다는 것을 보여준다. 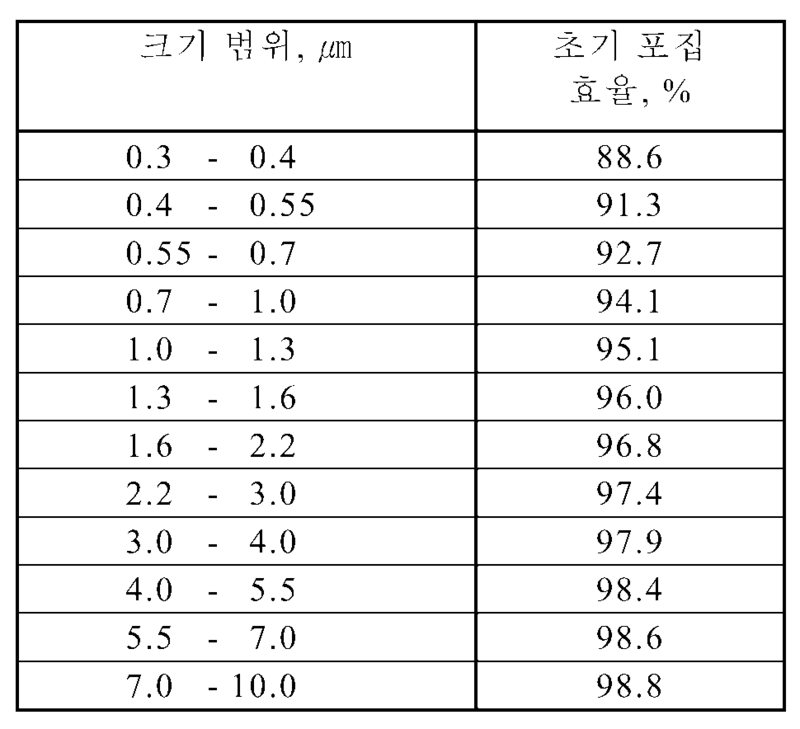 The data in Table 1B shows that the service 0.25 ㎪ (1.0 inchi H 2 O) more efficiently and more satisfactory collection performance in the pressure drop (holding capacity) than the filter made in the filter of Example 1 from eokyu air medium. 실시예 1의 매체를 또한 필터의 양 측면 상의 주름 선단에 확장된 와이어 스크린을 접착함으로써 주름 필터 요소를 제조하기 위해 사용하였다. Conducting medium of Example 1 was also used for the manufacture of a pleated filter element by bonding a wire screen to expand the distal end folds on both sides of the filter. 필터를 필터 요소의 양 측면 상의 필터 주연부 위에서 접힌 28 ㎜ (1.1 인치) 플랩을 갖는 2-부분 판지 프레임으로 프레임화하였다. A filter screen frame was a two-part frame having a collapsed carton 28 ㎜ (1.1 in) flaps on the filter peripheral portion on both sides of the filter element. 필터의 개방 영역은 대략 44.5 × 57.2 ㎝ (17.5 × 22.5 인치)였다. Open area of ​​the filter was about 44.5 × 57.2 ㎝ (17.5 × 22.5 in.). 필터 요소를 1.52 m/sec (300 ft/min)의 면 속도에서 초기 압력 강하 및 초기 포집 효율(fractional efficiency)에 대해 시험하였다. The filter element was tested for the initial pressure drop and initial collection efficiency (fractional efficiency) in the surface speed of 1.52 m / sec (300 ft / min). 초기 압력 강하는 0.05 ㎪ (0.19 인치 H 2 O)였다. The initial pressure drop was 0.05 ㎪ (0.19 inchi H 2 O). 개별 입자 크기 범위에 대한 결과를 아래의 표 1C에 도시한다. The results are shown for individual particle size ranges are shown in Table 1C below. 표 1C의 결과는 이러한 필터에 대한 평균 초기 서브마이크로미터 효율이 47%였다는 것을 나타낸다. The results of Table 1C shows that the average initial sub-micrometer efficiency for such a filter was a 47%. 아래에서 달리 표시되는 것을 제외하고는 실시예 1의 일반적인 방법을 사용하여, 1성분 단층 웨브를 피나 3868 폴리프로필렌으로부터 형성하였다. With the exception that the indicated otherwise below, and uses the general method of example 1, it was formed from 3868 polypropylene blood or a one-component single layer web. 압출 헤드(10)는 각각 36개 오리피스의 18개의 열을 가지며, 이들은 다이의 중간에서 16 ㎜ (0.63 인치) 갭으로 분리된 9개의 열의 2개의 블록으로 분할되어, 총 648개의 오리피스를 이루었다. Has a heat of 18 to 36, each orifice is the extrusion head 10, which is divided into two blocks in the middle 16 ㎜ (0.63 in. ), Separated by a gap of 9 columns of the die, finished, a total of 648 orifices. 오리피스들을 6.4 ㎜ (0.25 인치) 간격의 엇갈린 패턴으로 배열하였다. Orifices were arranged in a staggered pattern of 6.4 ㎜ (0.25 inch) intervals. 중합체를 구멍당 1.0 g/min로 압출 헤드로 공급하였다. The polymer was 1.0 g / min per hole was fed to the extrusion head. 2개의 급랭 공기 스트림(도 2의 18b; 스트림(18a)은 이용하지 않음)을 0.42 m/s (83 ft/min)의 대략적인 면 속도 및 4.4℃(40℉)의 온도로 높이가 406 ㎜ (16 인치)인 급랭 박스로부터의 상부 스트림으로서, 그리고 0.14 m/s (28 ft/min)의 대략적인 면 속도 및 주위 실온으로 높이가 197 ㎜ (7.75 인치)인 급랭 박스로부터의 하부 스트림으로서 공급하였다. Two quenching air streams (Fig. 2 of 18b; stream (18a) is not used), the height at a temperature of approximate surface speed, and 4.4 ℃ (40 ℉) of 0.42 m / s (83 ft / min) 406 ㎜ (16 in) of an upper stream from quench boxes, and supply as a bottom stream from the quench boxes 0.14 m / s (28 ft / min), rough surface speed and a 197 ㎜ (7.75 inch) height to around room temperature It was. 1.27 ㎜ (0.050 인치)의 에어 나이프 갭, 0.17 ㎫ (24 psig)의 압력으로 에어 나이프로 공급되는 공기, 4.8 ㎜ (0.19 인치)의 세장화기 상부 갭 폭, 및 4.7 ㎜ (0.185 인치)의 세장화기 바닥 갭 폭을 사용하는, 베리건 등에 도시된 것과 같은 가동 벽 세장화기를 이용하였다. Elongated weapon of 1.27 ㎜ (0.050 inch) air knife gap, 0.17 ㎫ (24 psig) air elongated weapon top gap width of the knife supplied to the air, 4.8 ㎜ (0.19 in. ), And 4.7 ㎜ (0.185 in.) At a pressure of using a bottom gap width, it was used as the movable wall elongated heat sources such as those shown or the like berry gun. 압출 헤드(10)로부터 세장화기(16)까지의 거리는 78.7 ㎝ (31 인치)였고, 세장화기(16)로부터 수집 벨트(19)까지의 거리는 68.6 ㎝ (27 인치)였다. Was elongated weapon distance 78.7 ㎝ (31 in.) Up to 16 from the extrusion head 10, the distance was 68.6 ㎝ (27 in.) To the collection belt 19 from the elongated weapon (16). 멜트스펀 섬유 스트림을 약 51 ㎝ (약 20 인치)의 폭으로 수집 벨트(19) 상에 적층시켰다. The melt spun fiber stream was deposited on the collection of about 51 ㎝ belt 19 in a width of (about 20 inches). 수집 벨트(19)는 15.8 m/min (52 ft/min)의 속도로 이동하였다. Collection belt 19 was moved at a speed of 15.8 m / min (52 ft / min). 공기를 3.8 × 55.9 ㎝ (1.5 인치 × 22 인치)인 슬롯(109)에서 약 11.4 ㎥/min (400 ft 3 /min)의 공기를 제공하기에 충분한 속도로 도관(107)을 통해 공급하였다. Was fed through conduit 107 at a rate sufficient to provide air in the air 3.8 × 55.9 ㎝ (1.5 inchi × 22 in.) Of the slot (109) to about 11.4 ㎥ / min (400 ft 3 / min) at. 플레이트(108)의 바닥은 수집기(19) 상의 수집된 웨브(20)로부터 약 1.9 ㎝ (3/4 인치) - 2.54 ㎝ (1 인치)였다. The bottom of the plate 108 is about 1.9 ㎝ (3/4 inch) from the collected web 20 on the collector (19) was 2.54 ㎝ (1 inch). 급랭식 유동 히터의 슬롯(109)을 통과하는 공기의 온도는 하우징(101) 내로의 가열된 공기의 진입 지점에서 측정할 때 155℃(311℉)였다. The temperature of the air passing through the slot 109 of the quenched flow heater was 155 ℃ formula (311 ℉), as measured at the point of entry of the heated air into the housing 101. 급랭 영역(120)을 벗어나는 웨브는 자립식이며 통상의 공정 및 장비를 사용하여 취급할 수 있기에 충분한 완전성을 갖도록 결합되고, 웨브는 저장 롤로의 통상의 권취에 의해 권취될 수 있거나 또는 주름 형성 및 주름 필터 패널과 같은 여과 장치로의 조립과 같은 다양한 작업을 거칠 수 있다. The web out of the quenching zone 120 is coupled because it can be treated using conventional processes and equipment self an expression have sufficient integrity, the web may be wound by conventional winding of a storage roll, or blank-and wrinkle filter It may be subjected to various operations such as the assembly of a filtering apparatus, such as a panel. 웨브를 코로나 대전시키고, 이어서 미국 특허 제5,496,507호(안가드지반드 등)에 개시된 기술에 따라 탈이온수로 하이드로차징시키고, 건조되게 하였다. And corona charging the web, followed by U.S. Patent No. 5,496,507 (not a guard ground DE, and so on) and hydro-charging with deionized water according to the technique disclosed in, to dry. 대전된 웨브는 아래의 표 2A에서 작업 번호(Run No.) 2-1로서 도시된 편평 웨브 특성을 측정하기 위해 평가하였다. The charged web was evaluated for in Table 2A below, to determine the flat web properties shown as 2-1 job number (Run No.). 유사한 공정 조건에서 제작된 제2 대전 웨브도 아래의 표 2A에서 작업 번호 2-2로서 도시된 그의 편평 웨브 특성을 결정하기 위해 평가하였다. The second charged webs produced in a similar process conditions were also evaluated to determine the flat web properties shown as his job number 2-2 in Table 2A below. 작업 번호 2-2는 0.18 ㎫ (26 psig)의 압력으로 에어 나이프에 공급되는 공기, 0.37 m/s (73 ft/min)의 상부 급랭 박스 면 속도, 152℃(306℉)의 급랭식 유동 히터 공기 온도, 약 8.5 ㎥/min (300 ft 3 /min)의 공기를 제공하기에 충분한 급랭식 유동 히터 속도, 및 245℃(473℉)의 압출 헤드 온도를 포함하였다. Job number 2-2 is air supplied to the air knife at a pressure of 0.18 ㎫ (26 psig), 0.37 m / s (73 ft / min) flow quench type heater of the upper quench box face velocity, 152 ℃ (306 ℉) of an extrusion head temperature of the quench sufficient style flow heater speed, and 245 ℃ (473 ℉) to provide the air temperature, air of about 8.5 ㎥ / min (300 ft 3 / min) was included. 작업 번호 2-1의 웨브를 20 ㎜의 주름 높이 및 4.6 ㎜의 주름 간격을 갖는 주름 필터 요소로 형성하였다. The web of the operation numbers 2-1 to form a pleated filter element having a wrinkle height and the blank interval of 4.6 ㎜ 20 ㎜. 주름은 필터의 양 측면 상의 주름 선단에 확장된 와이어 스크린을 접착함으로써 안정화하였다. Wrinkles were stabilized by attaching the screen wires to the extended front end on both sides of the filter folds. 필터를 필터 요소의 양 측면 상의 필터 주연부 위에서 접힌 12.7 ㎜ (0.5 인치) 플랩을 갖는 1-부분 판지 프레임으로 프레임화하였다. A filter screen frame was a one-part frame having a paperboard both sides of the folded 12.7 ㎜ (0.5 inches) above the flap on the filter peripheral portion of the filter element. 필터의 개방 영역은 대략 188 × 305 ㎜ (7.4 × 12.0 인치)였다. Open area of ​​the filter was approximately 188 × 305 ㎜ (7.4 × 12.0 in.). 필터 요소를 1.52 m/s (300 ft/min)의 면 속도에서 초기 압력 강하 및 초기 포집 효율에 대해 시험하였다. The filter element was tested for the initial pressure drop and initial collection efficiency in terms of speed of 1.52 m / s (300 ft / min). 초기 압력 강하는 0.06 ㎪ (0.23 인치 H 2 O)였다. The initial pressure drop was 0.06 ㎪ (0.23 inchi H 2 O). 개별 입자 크기 범위에 대한 결과를 아래의 표 2B에 도시한다. The results are shown for individual particle size ranges are shown in Table 2B below. 표 2B의 결과는 이러한 필터에 대한 평균 초기 서브마이크로미터 효율이 67.8%였다는 것을 나타낸다. The results in Table 2B shows that the average initial sub-micrometer efficiency for such a filter was a 67.8%. 아래에서 달리 표시되는 것을 제외하고는 실시예 2의 일반적인 방법을 사용하여, 1성분 단층 웨브를 시바 스페셜티 케미칼즈의 0.75 중량%의 키마소브 944 장애 아민(hindered amine) 광 안정화제가 첨가된, 토탈 페트로케미칼즈로부터 입수 가능한 용융 유량 지수가 70인 피나 3860 폴리프로필렌으로부터 형성하였다. Except as otherwise noted below and in Example 2, using the general method of, the one-component single layer webs of Ciba Specialty 0.75% by weight of the key Massonnat probe 944 hindered amine (hindered amine) the light stabilization of Chemical's agent was added, the total the melt flow index, available from Petro Chemical's 70 was formed from the blood and 3860 polypropylene. 중합체를 구멍당 0.20 g/min로 압출 헤드로 공급하였고, 여기서 중합체를 235℃의 온도로 가열하였다. It was supplied to the extrusion head of the polymer with 0.20 g / min per hole, in which the polymer is heated to a temperature of 235 ℃. 상부 급랭 공기 스트림은 7.2℃(45℉)의 온도를 가졌고, 하부 급랭 공기 스트림은 0.16 m/s (31 ft/min)의 대략적인 면 속도를 가졌다. Upper quenching air stream had a temperature of 7.2 ℃ (45 ℉), lower quenching air stream had an approximate face velocity of 0.16 m / s (31 ft / min). 0.76 ㎜ (0.030 인치)의 에어 나이프 갭, 0.08 ㎫ (12 psig)의 압력으로 에어 나이프로 공급되는 공기, 5.1 ㎜ (0.20 인치)의 세장화기 상부 갭 폭을 사용하는, 베리건 등에 도시된 것과 같은 가동 벽 세장화기를 이용하였다. 0.76 ㎜ (0.030 inch) air knife gap, 0.08 ㎫ (12 psig) pressure air is knife supplied to the air, 5.1 ㎜ (0.20 inches) using an elongated weapon upper gap width, such as the one shown or the like berry case of the It was used for the movable wall elongated weapon. 멜트스펀 섬유 스트림을 약 53 ㎝ (약 21 인치)의 폭으로 수집 벨트(19) 상에 적층시켰다. The melt spun fiber stream was deposited on the collection of about 53 ㎝ belt 19 in a width of (about 21 inches). 수집 벨트(19)는 약 1.8 m/min (6 ft/min)의 속도로 이동하였다. Collection belt 19 was moved at a speed of about 1.8 m / min (6 ft / min). 수집 벨트(19) 아래의 진공은 1.5 ㎪ (6 인치 H 2 O) - 3.0 ㎪ (12 인치 H 2 O)의 범위 내에 있는 것으로 추정되었다. Collected under the vacuum belt 19 is 1.5 ㎪ (6 inchi H 2 O) - was estimated to be in the range of 3.0 ㎪ (12 inchi H 2 O). 공기를 슬롯(109)에서 약 14.2 ㎥/min (500 ft 3 /min)의 공기를 제공하기에 충분한 속도로 도관(107)을 통해 공급하였다. To the air from the slot 109 provides air at about 14.2 ㎥ / min (500 ft 3 / min) was fed through conduit 107 at a sufficient rate. 급랭식 유동 히터의 슬롯(109)을 통과하는 공기의 온도는 하우징(101) 내로의 가열된 공기의 진입 지점에서 측정할 때 164℃(327℉)였다. The temperature of the air passing through the slot 109 of the quenched flow heater was 164 ℃ formula (327 ℉), as measured at the point of entry of the heated air into the housing 101. 급랭 영역(120)을 벗어나는 웨브는 자립식이며 통상의 공정 및 장비를 사용하여 취급할 수 있기에 충분한 완전성을 갖도록 결합되고, 웨브는 저장 롤로의 통상의 권취에 의해 권취될 수 있거나 또는 주름 형성 및 주름 필터 패널과 같은 여과 장치로의 조립과 같은 다양한 작업을 거칠 수 있다. The web out of the quenching zone 120 is coupled because it can be treated using conventional processes and equipment self an expression have sufficient integrity, the web may be wound by conventional winding of a storage roll, or blank-and wrinkle filter It may be subjected to various operations such as the assembly of a filtering apparatus, such as a panel. 웨브를 미국 특허 제5,496,507호(안가드지반드 등)에 개시된 기술에 따라 탈이온수로 하이드로차징시키고, 건조되게 하였다. Was charged dihydro the web with deionized water according to the technique disclosed in the (not including guard ground DE) U.S. Patent No. 5,496,507 and, to dry. 대전된 웨브를 아래의 표 3A에 도시된 편평 웨브 특성을 측정하기 위해 평가하였다. The charged web was evaluated to determine the flat web properties shown in Table 3A below. 웨브를 20 ㎜의 주름 높이 및 4.6 ㎜의 주름 간격을 갖는 주름 필터 요소로 형성하였다. To form the webs into pleated filter elements having pleats height and the blank interval of 4.6 ㎜ 20 ㎜. 주름은 필터의 양 측면 상의 주름 선단에 확장된 와이어 스크린을 접착함으로써 안정화하였고, 실시예 2의 방법을 사용하여 1-부분 판지 프레임으로 프레임화하였다. Wrinkles were stabilized by attaching the screen wires to the extended front end folds on both sides of the filter, using the method of Example 2 was screen frame to the frame-part carton. 필터 요소를 1.52 m/s (300 ft/min)의 면 속도에서 초기 압력 강하 및 초기 포집 효율에 대해 시험하였다. The filter element was tested for the initial pressure drop and initial collection efficiency in terms of speed of 1.52 m / s (300 ft / min). 초기 압력 강하는 0.19 ㎪ (0.754 인치 H 2 O)였다. The initial pressure drop was 0.19 ㎪ (0.754 inchi H 2 O). 개별 입자 크기 범위에 대한 결과가 아래의 표 3B에 도시되어 있다. The results for individual particle size ranges are shown in Table 3B below. 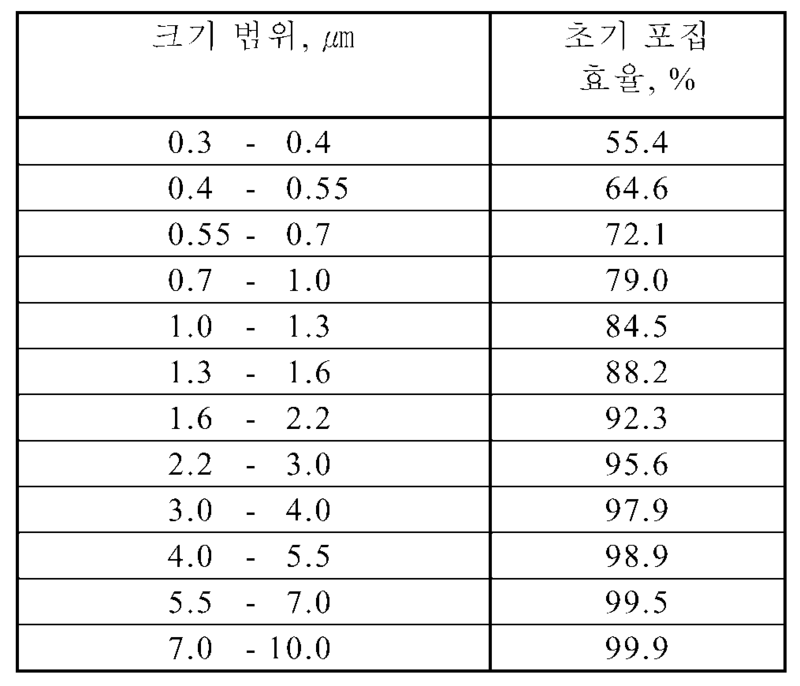 표 3B의 결과는 이러한 필터에 대한 평균 초기 서브마이크로미터 효율이 91.7%였다는 것을 나타낸다. The results in Table 3B shows that the average initial sub-micrometer efficiency for such a filter was a 91.7%. 본 발명의 다수의 실시 형태가 설명되었다. A number of embodiments of the invention have been described. 그럼에도 불구하고, 본 발명으로부터 벗어남이 없이 다양한 변형이 이루어질 수 있다는 것을 이해할 것이다. Nevertheless, it will be appreciated that various modifications made without departing from the invention. 따라서, 다른 실시 형태가 이어지는 청구의 범위의 범주 내에 있다. Accordingly, it is within the scope of the claims other embodiments that follow. 를 포함하는 주름 필터 제조 방법. The method comprises a pleated filter. 제1항에 있어서, 섬유들은 자발 결합되는 방법. The method of claim 1, wherein the fibers are how the spontaneous combination. 적어도 일부의 섬유 교차점에서 서로 결합된 동일한 중합체 조성을 갖는 부분적으로 결정질이고 부분적으로 비정질인 배향된 멜트스펀 중합체 섬유들의 자립식 다공성 1성분 단층 매트릭스를 포함하는 주름 필터로서, 상기 매트릭스는 접히거나 물결 모양의 소정 열의 주름으로 형성되고 1.52 m/s의 면 속도에서 적어도 15%의 평균 초기 서브마이크로미터 효율을 갖는 주름 필터. A pleated filter including at least a partially crystalline and partially independent of the amorphous oriented melt-spun polymer fibers formula porous one-component single layer matrix with some fibers the same polymeric composition bonded to each other at the cross point of the matrix is ​​folded or wavy predetermined heat wrinkles are formed in at least 15% of the average initial sub-pleated filter having a micrometer efficiency at 1.52 m / s face velocity. 제3항에 있어서, 섬유들은 자발 결합되는 주름 필터. The method of claim 3, wherein the fibers are pleated filter coupled spontaneous. BE1010654A3 (en) * 1996-09-30 1998-11-03 Solvay Process of implementation of a thermoplastic semi-crystalline.